You are currently browsing the tag archive for the ‘rett’ tag. So many of our kids suffer from gut problems – constipation, reflux, bloating and pain. Despite the prevalence of GI issues in Rett this is an area that has been mostly unexplored by scientists. So we are happy to add Dr. Ali Khoshnan of Caltech to our growing list of funded researchers. Dr. Khoshan will be exploring the gut physiology of mice models of Rett. He will also be testing a powerful probiotic (not currently available for people) in the mice to see if any Rett symptoms improve. Watch the video below to learn how the study of the microbiome (the community of microorganisms that populate us and outnumber our cells 10:1) has become a very hot field in science and how it might be applied to Rett Syndrome. 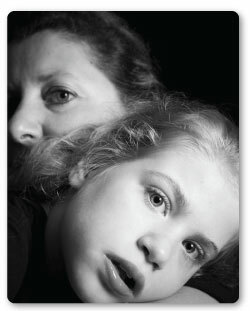 Anyone who knows anything about Rett Syndrome knows that the disorder is primarily seen in girls. The disorder is caused by disruption of the MECP2 gene located on the X chromosome. Girls have two X chromosomes one with the disrupted gene and one with the healthy gene. Having some healthy MeCP2 protein allows girls to survive but at the expense of severe impairment that comes with Rett. The fact that boys only have one X is the reason most often given for why Rett is seen in girls. However this is not accurate. While having the sole X is the reason boys often succumb to the disease it is NOT the reason why Rett is primarily a woman’s disease. That reason has to do with where the MECP2 mutation originates. Many studies over the past decade have provided evidence that the vast majority of MECP2 mutations originate in the sperm. Since fathers give an X to their daughters and a Y chromosome to their sons the MECP2 mutation can only be transmitted from father to daughter. This is the reason why Rett is seen primarily in girls. Scientific papers over the years have hypothesized that because male fetuses only have one X their disease would be so severe that they might not even develop to full term and the mothers might miscarry. There is no clinical data to support this hypothesis whatsoever. Due to the sheer volume of sperm that is continuously made it is likely that all men produce sperm with MECP2 mutations. One in about 20,000 eggs will be fertilized with a sperm that has an MECP2 mutation in it – the cruel reality of genetic roulette. A year ago today I started as program director for RSRT. I thought I would share a few reflections about the people I’ve met and what I’ve experienced and learned over that time. Before starting at RSRT I had met two girls with Rett Syndrome—my own daughter and Monica’s daughter. 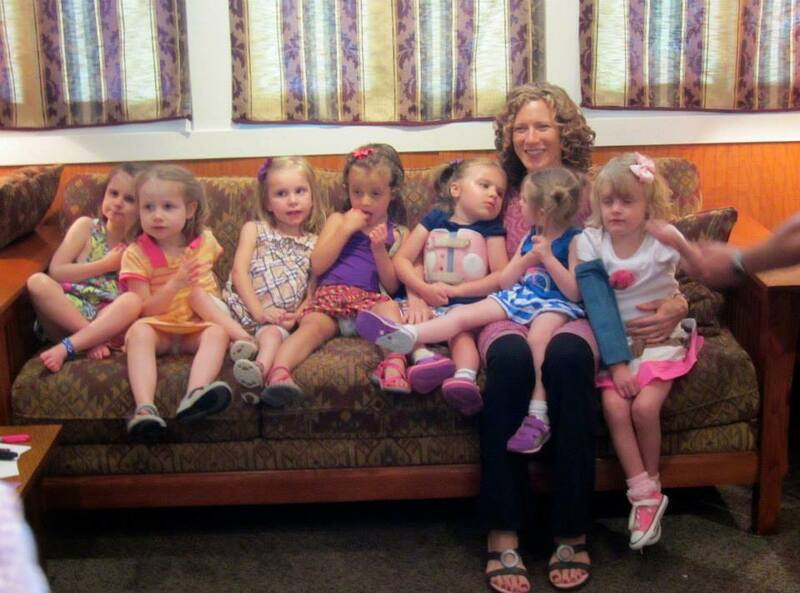 Now, in my travels to events and meetings with families, I have met 47 girls and young women with Rett. Each of them, often despite terrible symptoms, has tried to engage me in some way, sometimes just through a flash of the eye or a smile. I met a teenage girl at an event who had been seizure-free for six months. But midway through the event she had a seizure. I watched as she trembled and her muscles seized; a single tear rolled down her cheek. Was it pain, frustration, fear? It was so clearly all of those. Her father and mother cried too. So did I. Of all I have learned and experienced over the last year, nothing sticks in my memory or keeps me awake at night like the faces of these girls and women and the strength I have seen in them and in their families. Our daughters have reminded me again and again without saying any words that it’s imperative that we change their lives. I have also learned that it’s we—the families of girls and women with Rett—who are going to make this happen. We are the leaders in this cause. I’m not at all suggesting that we families have to throw money at this. I am well aware that we all have plenty on our plates; we have to live our lives, and the daily challenges of Rett Syndrome add emotional and financial stresses that most people don’t even have to think about. So we can’t be expected to shoulder the full burden of supporting Rett research on top of everything else. But, we all can make a critical difference by getting friends and contacts to support RSRT. Thanks to the efforts and outreach of some Rett families, many people who are not directly affected by Rett have generously and happily supported the research and have made it a priority for their giving. We, all of us families, have to continue and expand this outreach to our friends and contacts. Our daughters’ futures depend on it, and we all must get involved if we are to turn the possibility of a cure into a reality. My respect for Monica and for RSRT as an organization, already great when I started, has only grown. I wanted to work for RSRT because I knew it did one thing and one thing only—supported research to find a cure. This is what I want. This is what we all want. I’ve worked in the non-profit world long enough to know that a 4% administrative cost rate is remarkable. The fact that RSRT spends 96 cents of every dollar directly on research is a reflection of its dedication, efficiency, and integrity. This is not an organization that is flashy or that spends a lot of time or money promoting its accomplishments; instead it focuses on finding a cure for Rett Syndrome. The result is, well, results. It is RSRT-supported scientists who are accumulating the knowledge needed to take the next steps in gene therapy and other promising approaches. I can talk about RSRT this way because I’m still new and in a way I’m looking from the outside in, as a parent. I have had nothing to do with this organizational culture myself; it is driven by Monica, by the RSRT trustees, and by the families that support us. I have learned a lot about the science behind Rett Syndrome. I have much more to learn, but I know enough to say definitively that a cure is much more than a dream. It is a very realistic possibility. But it’s not going to happen unless we grow RSRT’s financial resources above and beyond the funds we raise from existing events. Money matters in scientific research. The more money RSRT has, the more resources it can put into projects like the Gene Therapy Consortium, and the faster and more efficiently these projects are likely to lead to a cure. I know this has turned into a pitch—not for your dollars, but for your involvement. I am somewhat of a shy person by nature, so I guess I’ve also learned over the last year not to be shy about asking for help. There is so much to gain by it. 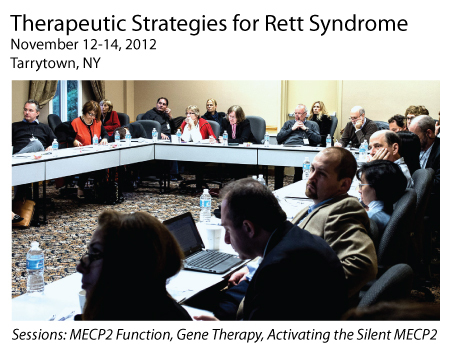 We need more of you—as many Rett families as we can get—involved and supporting RSRT. Whether you are a parent, grandparent, aunt or uncle, cousin, or sibling—start an event of your own; support an existing event and get friends to join you; do a letter writing campaign. I know all of our lives are busy and full of the challenges of Rett Syndrome. If you can’t do a lot, do a little. But do something. It all makes a difference. To all of you reading this who are involved already, this is a big thank you. None of what RSRT does would be possible without you. I have one further thought. I know it’s hard to consider ourselves fortunate. My wife and I often find ourselves asking why us—why did our beautiful, bright-eyed daughter get such a bad roll of the dice? But when I take a step back and look at the bigger picture, I see that we are very fortunate. We’re fortunate that scientists have pinpointed the cause of Rett Syndrome; we’re fortunate that Adrian Bird demonstrated that Rett is a reversible condition; we’re fortunate that the best geneticists and neurobiologists in the world are now attracted to Rett research and are taking the next steps on Prof. Bird’s discovery; we’re fortunate that we have RSRT to lead, support, and push forward the science; and we’re fortunate that we have a cause that speaks to people so compellingly and with so much promise. Most of all, we are fortunate to have our daughters; to love them and to be loved by them in such a profound and special way; and to see brightness in their futures. Start a new event. Anyone can start an event—parents, grandparents, brothers and sisters, aunts and uncles. Events can be whatever you want them to be—a gathering in a home, a picnic in a park, or a big gala. We can help you with ideas and planning. If you live in an area that already has an RSRT event, please get involved. Come to the events and get friends to join you, ask for sponsorships, and donate auction items. Do a letter-writing campaign to your friends and contacts. This is easy to do, and we can help. Most people are thrilled to support our cause. But they need to learn about it and be asked. A thoughtful letter from you can do this. We can help you draft it and even mail it out for you. Raise funds online. This is easy and fun to do. Go to FirstGiving and click on “Start Fundraising.” You can do this for an occasion like a birthday or anniversary, for a run or a walk, or in honor or memory of someone. We need all hands on deck. Rett research is poised for breakthroughs, but we need help from the entire Rett community. To get started, contact Tim at 609.309.5676 or tim@rsrt.org. Thank you! 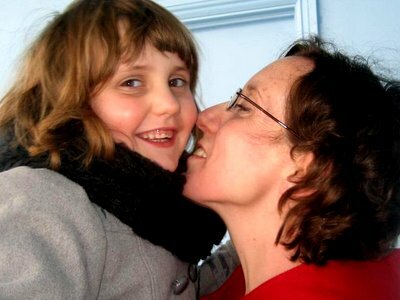 There is no mystery about why a girl suffers from Rett Syndrome. The cause is the mutated copy of the MECP2 gene inhabiting her cells. But since MECP2 is on the X chromosome and all females have two X’s, beside each mutated gene rests a healthy but silenced twin. What if we could replace the flawed gene by reawakening its silenced counterpart? If we could wake up MECP2 in enough cells we could conceivably reverse Rett symptoms. This is an approach that RSRT has championed since our launch in 2008. We are funding seven labs that are pursuing this line of work. You may ask why do we need multiple labs working on the same goal. Isn’t that a waste of effort and money? The answer is a resounding “NO”. While the end game is the same each lab is using a different strategy to get there. For example, the types of cells that labs are utilizing are different. Ben Philpot and colleagues at UNC are working with mouse neurons, Toni Bedalov and Jeannie Lee are using fibroblast cells, others still are using human cells. Each cell type has its own set of advantages and disadvantages. The labs are also using different “reporters” – meaning how the cells are designed to detect activation of MECP2. Different compound libraries at different concentrations are being screened. Compounds are also being screened at various degrees of high and low throughput. And finally different criteria are being employed to define a “hit” (drugs that reactivate MECP2). Having multiple labs attack this problem gives us more shots on goal and added assurances regarding the quality of any potential hits. Two weeks ago we gathered everyone tackling this approach and brought them together for two intense days of talks and discussions. plus advisors from NIH and industry participate at meeting in Chapel Hill, NC. Over the past 15 years I’ve organized dozens of meetings and before each one I worry – will the discussions be forced or will they flow naturally? will collaborations ensue? It was no different with this meeting. The first few talks of the day however quickly put me at ease. While a number of common hits were reported in multiple labs much validating and further screening remains to be done. At the meeting, and in emails and phone calls since, the scientists are working out the logistics of validating each others hits, trading cell lines and compounds. Exactly the outcome I was hoping for. We thank all of our supporters who make it possible for us to fund innovative, out-of-the-box projects that we believe will move us towards a cure for Rett by leaps rather than small incremental steps. Monica Coenraads is discussing work with two business associates in the living room of her Trumbull, Conn., home on a recent spring morning, when the conversation turns to the benefits of face-to-face communication over reliance on electronic devices. Suddenly, a squeal of laughter erupts from the other side of the room, where her 17-year-old daughter, Chelsea, has been relaxing on the couch, quietly listening to her mother’s every word. “Chelsea thinks it’s funny, because she believes her mom spends too much time on her phone,” explains Coenraads, who works from her house. In homes across America, parents and kids are debating texting, cell phones and screen time. But for the Coenraads family—Monica, husband Pieter, and sons Alex, 15, and Tyler, 14,—the focus is on discovering any method by which Chelsea can communicate. The slender, brilliant-blue-eyed girl, who bears a striking resemblance to her mother, has Rett syndrome, a rare, genetic, neurological disease that locks her thoughts inside her head, as she is unable to speak or to use her hands. With great determination and without speech or hand gestures, Chelsea expresses herself by focusing her gaze on pictures in a three-ring binder of the words she’d like to say. “A child with classic Rett syndrome is in a wheelchair, unable to talk, fed through a feeding tube, with seizures, anxiety, orthopedic issues, scoliosis, contractures and no hand function,” said Coenraads, co-founder and executive director of Rett Syndrome Research Trust (RSRT) and its director of research. The former restaurateur is credited with helping to raise more than $37 million for research into Rett syndrome since her daughter’s diagnosis 15 years ago. UMass Medical School scientist Michael R. Green, MD, PhD, globally known for his work in gene regulation, keeps the image of Chelsea and that of other girls who suffer from Rett in mind as he works toward finding a drug that would reverse the disease. Dr. Green, a Howard Hughes Medical Institute Investigator, the Lambi and Sarah Adams Chair in Genetic Research and professor of molecular medicine and biochemistry & molecular pharmacology, received a $750,000 grant from RSRT for research aimed at reversing the underlying cause of the disorder. He is one of several dozen researchers around the world, recruited by Coenraads, who have met children with Rett and their parents, and are working on therapies, a cure or a reversal of the disease. Rett syndrome is caused by a mutation of the gene on the X chromosome called MECP2 that causes numerous devastating symptoms that worsen over time. The symptoms begin in early childhood and leave Rett sufferers completely dependent on 24-hour-a-day care for the rest of their lives. While the function of MECP2 remains elusive, scientists know that it acts globally and impacts numerous systems in the body. Female cells have two X chromosomes and therefore two copies of the MECP2 gene, and mutations occur in only one of the two copies of the gene. In females, however, one of the two X chromosomes is randomly turned off (or silenced), a phenomenon called X chromosome inactivation (XCI). As a result, in patients with Rett syndrome, half of the cells express a normal copy of MECP2 and the other half express the mutant copy. Importantly, in those cells that express the mutant MECP2, the normal copy is still present—just silent. Green is testing drugs that modulate XCI to reactivate the silent normal MECP2 gene in these cells as a strategy to reverse the disease. Green praised the support he has received from RSRT and said the work that Coenraads and her colleagues do is inspirational. Faced with the complex problem of discovering the elusive function of the Rett protein, RSRT set out to conduct an experiment of our own. We shook the conventional practice of laboratories working in isolation and instead convened three scientists to work collaboratively: the MECP2 Consortium. We gave them the necessary financial resources and provided infrastructure including in-person meetings. The results surprised us all. The MECP2 Consortium was launched in 2011 with a $1 million lead gift by Tony and Kathy Schoener. RSRT has committed an additional $3.4 million of funding to the Consortium. We are extremely grateful to the Schoeners for their second $1 million pledge to support this effort. The Consortium quickly reported significant advancements. The Mandel and Bird labs showed, for the first time, a dramatic reversal of symptoms in fully symptomatic Rett mice using gene therapy techniques that could be utilized in people. 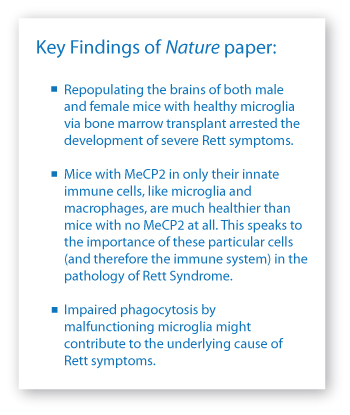 The “Rett mouse” moving around received healthy Mecp2 via gene therapy. The immobile mouse did not receive treatment. The video was taken four weeks after treatment. The Bird lab discovered that the function of the Rett protein, MeCP2, depends on its ability to recruit a novel binding partner, NCoR/SMRT to DNA. Disrupt that ability and the symptoms of Rett ensue. The Greenberg lab built on the work of the Bird lab and discovered that adding a phosphate group to MeCP2 alters its ability to interact with NCoR/SMRT and affects the expression of downstream genes. While the clinical implications of the gene therapy experiments are obvious some may think “so what?” when it comes to the NCoR experiments. I suspect that in the mind of many Rett parents the best evidence of research progress is clinical trials. However, this is often not the best measure of progress. So I will argue that investing in a better understanding of MECP2 – a primary goal of this Consortium – is money well spent, as it will add to our current arsenal of strategic approaches to combat Rett. A repurposed drug may partially treat some of the symptoms, but to achieve the kind of dramatic improvement that most parents and I ache for will likely require attacking the problem at its very root. As Rett parents will attest to the symptoms of the disorder are numerous and devastating. Whatever MECP2 is doing, it’s acting globally on many systems in the body. A repurposed drug may partially treat some of the symptoms but to achieve the kind of dramatic improvement that most parents and I ache for will likely require attacking the problem at its very root. There are multiple ways to achieve this end goal: gene and/or protein therapy, activating the silent MECP2, modifier genes. These are all areas in which RSRT is financially and intellectually engaged with. In parallel, however, it is imperative to understand what MECP2 does. RSRT has therefore committed an additional $3.4 million of funding to the MECP2 Consortium. We are extremely grateful to Tony and Kathy Schoener for their second $1 million pledge to support this important project. I recently discussed the experiences of the past few years and what lies ahead with the Consortium members. Greenberg: Research in neuroscience is undergoing a revolution. We now have the technologies in hand to solve some of the most difficult neurobiological questions. However, progress towards answering these hard questions requires scientists working together. A single lab working alone doesn’t have the expertise or the resources to make significant progress when the scientific problem is particularly challenging. The MECP2 Consortium is a model for something much bigger: how neuroscience overall needs to operate so that we can find therapies and cures for disease. The MECP2 Consortium is a model for something much bigger: how neuroscience overall needs to operate so that we can find therapies and cures for disease. We are scientists in different parts of the world, working together, sharing their results long before publication, and brainstorming openly on a regular basis. The different perspectives of the three labs allow for a wonderful exchange of ideas to advance the science. I believe this is what the Consortium is all about. We have ignored the typical barriers of geography and have brought together scientists from Edinburgh, Portland, and Boston on a regular basis. The results have been stunning. There has been much more rapid progress than would have been made by the individual labs. Consortium meeting in Boston in November of 2013. Bird: I agree. An over arching goal of the Consortium is to understand the way the MECP2 protein works at the molecular level. We are at last starting to make real progress on this and will be testing some of the new ideas in cellular and animal models. Our ultimate aim is to use this new knowledge to provide rational approaches to therapy. Mandel: Front and center is always our goal to find a therapy for Rett. This guides our experiments and keeps us focused. The fact that financial support comes from families who have a child with Rett and their networks makes us work harder. Coenraads: In your opinion what are the elements that have made this consortium “work”? Greenberg: Trust and openness, a willingness on the part of all three Principal Investigators to talk through any potential problems immediately as they come up. A willingness to check egos at the door so that we can work together for something that is more important than our individual advancement. 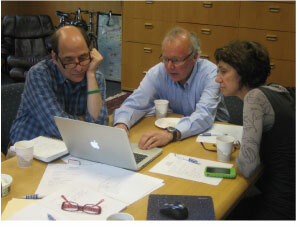 Importantly the participants, Mandel, Bird, Greenberg and Coenraads like and trust each other. Bird: We all have different backgrounds and interests, but we share a commitment to understanding Rett Syndrome. We compliment each other surprisingly well. Mandel: The regular meetings and exchanges and the quality of the scientists involved have been key factors as well as the availability of sufficient funding for each of us to follow our scientific noses. Coenraads: Fortunately science is not linear. There are technologies available now that weren’t available when the Consortium started. How does this impact your Rett research? Greenberg: There are a lot of new technologies available – in particular Cre lines that will allow us to study the effect of MeCP2 loss in a relatively homogeneous population of neurons, CRISPR and Talen technology that will facilitate gene correction, and genomic technologies that are providing a new understanding of the role of methylation in the control of neuronal gene expression. Also, better equipment, such as microscopy will help. Bird: The technologies for genetic modification have existed for a decade, but the advent of CRISPR has made this facile. Being able to edit genetic mistakes in patients is no longer a science fiction dream, but has become a real possibility. Exploring this option will be an important focus for the Consortium. 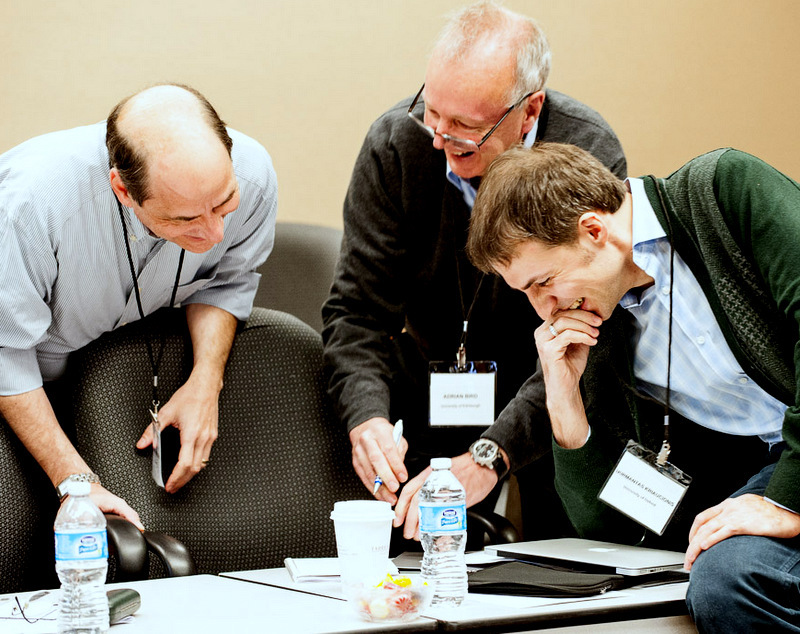 Coenraads: Harrison Gabel from Mike’s lab recently shared with me in an email: Our group meetings are essential to critically assessing our work. 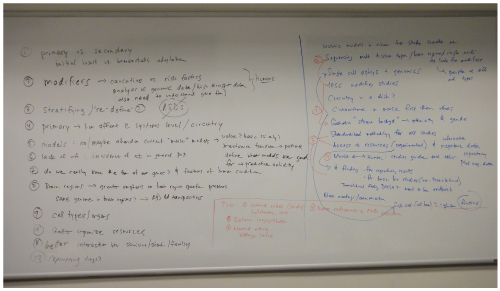 Each lab group has its own “world view,” and having that view shaken up every six months is very constructive. So I look forward to lots more critical assessments and worldviews getting shaken as together we get to the bottom of what MeCP2 does. * Due to the success of the MECP2 Consortium, and its positive gene therapy findings, RSRT has just announced funding for a second consortium: the MECP2 Gene Therapy Consortium. Read more about this newly formed second collaboration. The videos below are perhaps the most well-known in the Rett community. If you love a child with Rett then chances are you’ve watched them obsessively. This work published in 2007 by Adrian Bird, declared to the world that Rett is reversible, but did not tell us how this could be done in people. Fast-forward six years and the video below from the RSRT-funded labs of Gail Mandel and Adrian Bird may have given us an answer: gene therapy. The mouse moving around was given gene therapy treatment and received healthy Mecp2 gene. The immobile mouse did not receive treatment. The video was taken four weeks after treatment. So how do we make the giant leap from recovered mice to recovered children? To move us towards this goal, RSRT has launched their second collaborative group – the MECP2 Gene Therapy Consortium. This new group comes after the success of RSRT’s MECP2 Consortium, established in 2011, that led to the initial encouraging gene therapy findings. With a budget of $1.5 million the members of this international gene therapy collaboration are charged with tackling the necessary experiments to get us to clinical trials as quickly as possible. Coenraads: Let’s jump right in. Why Rett? Why now? Cobb: While there have been major advances in understanding the molecular actions of the MeCP2 protein, it is still difficult to conceive of a small ‘traditional’ drug molecule being able to mimic its function. While traditional drug approaches will likely be restricted to correcting specific aspects of what goes wrong in Rett it is conceivable that gene therapy can correct the cause of Rett at its very source and thus provide a profound recovery of function. Mandel: It has been known for some time now that when MeCP2 is expressed genetically in cells throughout an MeCP2-deficient mouse, major Rett symptoms are reversible in mice. Two of the big outstanding questions then are: 1) Will this be true for humans and 2) Can we add MeCP2 back to patients and also achieve reversal? The first question is currently still an open question, although upcoming experiments using human neurons and astrocytes derived from iPSCs and xenografts (transplanting human cells into mice) may provide some important clues. The second question is challenging because currently there are no reliable ways to introduce MeCP2 throughout the brain, although recent studies in mice, funded through RSRT consortiums, suggest that AAV9-mediated transduction (delivery via a virus) might have potential. Therefore, two advancing technologies, iPSCs and AAV9 viruses, are converging to compel us to jump right in now. Kaspar: A major advantage in Rett is that the genetic target is defined for us: MeCP2. Another advantage is that it’s not neurodegenerative – neurons don’t die. And importantly, we know that restoring the proper level of MeCP2, even later in life, at least in a mouse, results in dramatic improvements. Why now? Because the gene therapy field now has an arsenal of powerful new tools. We have at our disposal a tool kit that can express genes for long periods of time and that can target many cell types efficiently throughout the entire nervous system. Our challenge will be to utilize our toolkit to hit the precise cells at the right expression levels. I’m certain we can accomplish this goal. Gray: That said, the devil is in the details. We have to get MeCP2 broadly distributed throughout the whole brain, which is something that has been done in animals but not yet in humans. Just as important, we have to be very careful to get the level of MeCP2 correct – too little may not work well enough and too much could cause a different spectrum of disease. Coenraads: What have we learned thus far regarding gene therapy for Rett? Kaspar: We’ve learned that a single one-time administration of a gene therapeutic can have a clinically meaningful result in the workhorse rodent model of this disease, even when delivered later in life. The results have been quite promising, and now multiple laboratories have similar promising results, it’s not just an isolated manuscript happening in one laboratory. Using similar approaches, multiple groups have encouraging results. That’s good for science and that’s good for Rett patients. Steve Gray (far right) and Stuart Cobb (second from the right) at an RSRT science meeting in late 2012. Cobb: The studies have also shown that the level of MeCP2 protein produced by the gene therapy is not producing any obvious defects in its own right and it therefore seems possible to deliver protein within limits that are tolerable to cells. We have also learned that it is not necessary to ‘hit’ all cells with the virus, this is never going to be achievable in practice anyway. Fortunately, a substantial therapeutic impact may be achieved by delivering the gene to a subset of cells. Of course the absolute number of cells, the types of cells and location in the brain is likely to be very significant. These are important issues that will be investigated by the MECP2 Gene Therapy Consortium. Gray: Finally, the studies tell us that we have to be very careful how we target the MeCP2 gene, to make sure too much isn’t delivered to a particular organ, such as the liver. Coenraads: Have you ever worked in collaboration with multiple labs? What do you think are the advantages? Could there be disadvantages? Mandel: I have been fortunate enough to be part of a productive collaboration funded by RSRT to work on how MeCP2 functions normally, and in mutants, and to do, with Kaspar’s group and Adrian Bird, the initial pilot proof of principle for gene therapy for Rett, using AAV9 vectors. Gray: Most of my work is done in collaboration with other labs, and I’m very comfortable doing research that way. I have a small and fairly specialized lab. We aren’t experts at everything, and it is much more efficient to collaborate with someone that has expertise than try to develop it on your own. This speeds things up and raises the quality of the work. The keys to making it work are that everyone has to be fully committed, and there has to be a level of trust across the members of the consortium. Trust that you can share data openly, and trust that the work is being carried out to the highest standards. If one investigator isn’t doing their part or does sloppy science then things can fall apart. Stuart Cobb (right) with David Katz. Cobb: I have enjoyed a number of successful bilateral collaborations in the past but the formation of the four-lab Consortium is going to be a new venture for me. Clearly there will be big advantages in terms of pooling complementary expertise to make swift progress. However, there will also be challenges, one being the necessity to maintain very good communication within the Consortium to coordinate our efforts and work together efficiently. Kaspar: My laboratory is engaged in a number of collaborations and they are a major reason we have been successful. Our international collaborations have given us access to patient samples as well as opened the door to new ideas and interactions that just couldn’t be accomplished sitting in isolation. Collaborations bring everyone’s experience and expertise to the table and allow the participants to rapidly answer difficult questions. We don’t always have to reach consensus but the right team will be open to sharing ideas and comfortable with hearing criticism as well as be aligned on goals and focused on the patients. Coenraads: What are the strengths your lab brings to the table? Gray: We are part of one of the best gene therapy centers in the world, with a vector core facility that makes hundreds of research preps and several clinical preps each year. My lab in particular has, as its primary goal, a mission to develop nervous system gene therapy platforms. We’ve made enormous strides using existing vectors to their full potential, and also leading the way to develop newer and better vectors. Also, our experience bringing our Giant Axonal Neuropathy project to clinical trial gave us experience on the process of moving a biological from the bench to the bedside. Cobb: My own lab brings expertise in the neurobiology side in terms of accurately mapping out Rett syndrome-like features in mice and within the brain and being able to assess in detail the ability for gene therapy to improve aspects of the disorder. Mandel: I am a basic science lab and I have strengths in applying state of the art molecular tools to questions related to gene therapy. My lab also has much expertise in histology of the brain. Kaspar: We have successfully navigated two programs from bench research to human clinical trials. We have flexibility to focus on complex basic biology questions, while keeping in mind our goal to advance therapies towards human clinical trials. Coenraads: Gene therapy has had a rocky road. How do you view the field at the moment? Kaspar: Expectations and promises were far too high in the early days of gene therapy. I think transformative therapies go through this track of failing and then triumphing. One simply has to look at the field of organ transplantation as an example. I think gene therapy will triumph, but we still have much to learn and pay attention to. There is a great deal of excitement and hope in the field today. We have to be good custodians of this technology with laser focus on safety and design of human clinical trials. Gray: There are a lot of good things happening in the field right now with patients seeing major improvements in their lives as a result of gene therapy. The first gene therapy product received full regulatory approval last year in Europe. Biotechnology companies are taking an interest in gene therapy. Frankly, it is a good time to be in the field. Mandel: I think that there is a large and growing momentum now for gene therapy because of the huge advances in molecular biology and viral technologies. Coenraads: I find that the gene therapy area is polarizing – people love it or hate it – have you encountered a similar response? Cobb: Yes, I have indeed encountered such contrasting views. Even within the community of Rett clinicians, I have had views of gene therapy being ‘the obvious route to follow’ versus others expressing great skepticism. Interestingly, the view within industry has been more accepting, perhaps due to the massive shift towards biologicals (alternatives to classical small molecule drugs) that has occurred in recent years. Kaspar: Typically those that are not fans of this technology focus on past failures. With any transformative findings there will be disbelievers. I’m reminded by a quote from Alexander von Humboldt: There are three stages of scientific discovery: first people deny it is true; then they deny it is important; finally they credit the wrong person. Gray: I can’t blame some people for hating it. Gene therapy promised a lot early on, before the technology was very developed. Expectations should have been tempered somewhat while the science was worked out, but instead the field moved too fast and people got hurt. That said, I don’t think you should turn your back on a potentially revolutionary medical technology because of mistakes made over a decade ago when the field was in its infancy. If you take a fresh look at the things happening today, there is a lot of real and well-founded optimism. Mandel: As in any area of science, there are proponents and detractors. There are technical issues with gene therapy, such as scaling and side effects that need to be addressed before more people will lose some skepticism, although some skepticism is quite healthy and pushes us to be as rigorous as possible. Coenraads: Dr. Kaspar, tell us a bit about your experience bringing the Spinal Muscular Atrophy project to clinical trial. How long did it take from mouse experiments to trial? How much money was invested from your lab? 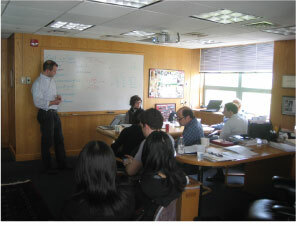 Brian Kaspar (middle) at an RSRT workshop. Kaspar: Our SMA program is quite exciting. We discovered the unique capacity for AAV9 to cross the blood brain barrier in 2009, in 2010 we were in progress to have the longest living SMA mouse in the world. We further tested safety and navigated the regulatory process including the NIH Recombinant Advisory Committee, the Food and Drug Administration and our institutional review board. Late in 2013 we were granted approval from the FDA and we will be injecting our first patients in a Phase 1/2 clinical trial early this year. It was a hectic 3-year process that cost $4 million and counting. We are excited and hopeful to help children with SMA type 1. Coenraads: Dr. Gray, you are developing a gene therapy treatment for a disease called Giant Axonal Neuropathy. Can you tell us about your experience with that project? How far from clinical trials are you? How long did it take from mouse experiments to trial? How much money did it cost? Gray: My GAN project has been life changing. This was the project that made the connection for me to patients and changed the way I think about research. Before then it was just about getting a good paper, or a grant, or doing the right things to advance my career. Now it is about making a real difference in the lives of people I’ve come to know and love. We’re on track to treat the first patient in the first half of 2014. We developed the treatment about 3 ½ years after starting the project, which included testing the treatment in the laboratory and developing an approach that should translate to humans. It’s taken another two years to start the trial. Our preclinical supporting studies were approximately $1.5 million. The FDA-required safety studies were another $0.75 million. We are budgeting another $1.5 million for the clinical trial. Most of these funds were provided by a small grass-roots foundation called Hannah’s Hope Fund. Coenraads: I’m delighted that you have all agreed to collaborate. I look forward to our bi-monthly phone calls and in-person meetings twice a year. Parents all over the world will be waiting anxiously to hear about your progress. As you know, there is a lot at stake. To profoundly impact a disorder with as many varied and debilitating symptoms as Rett Syndrome, it is likely that intervention must be directed toward the very root of the problem. There are several ways to do this: activate the silent back-up copy of the Rett gene; target modifier genes; explore gene therapy. Today, we announce a study funded through the MECP2 Consortium suggesting that gene therapy may indeed provide a feasible approach to treat Rett Syndrome. The work was led by Gail Mandel at Oregon Health and Sciences University in collaboration with Adrian Bird of the University of Edinburgh and Brian Kaspar of Nationwide Children’s Hospital. In the past sixty days, four key papers have been published detailing research advances supported financially and intellectually by RSRT. Three of those papers are funded through the MECP2 Consortium, a unique alliance launched by RSRT in 2011 among three leading labs: Bird, Greenberg (Harvard) and Mandel. If you are a donor to RSRT, the accelerated research these projects represent is the result of your money at work. We wish to express our gratitude to all of our generous supporters and the parent organizations that make this progress possible. Special thanks to our funding partners, the Rett Syndrome Research Trust UK and the Rett Syndrome Research & Treatment Foundation. Below are some resources to help you understand today’s announcement. In contrast to the leadership of most organizations we yearn for the day when RSRT is no longer in business – that will mean an end to Rett. Until that day comes we will continue to invest in high quality science. In the first half of 2013 RSRT has committed $1.7 million to new projects that range from basic science to clinical trials. We invite you to learn about our investments, which our donors have made possible. As always we welcome your questions and feedback. There is a multitude of data suggesting that mice models of Rett have low levels of a neurotrophic factor called BDNF (brain derived neurotrophic factor). BDNF is a very important and complex protein that is implicated in a variety of disorders. Increasing BDNF in the Rett mice models, either genetically or pharmacologically is beneficial. An FDA approved drug for multiple sclerosis called copaxone (or Glatiramer Acetate) is known for increasing BDNF and therefore of interest in treating Rett. RSRT has committed to funding an open label study of copaxone in two centers, the Tri-State Rett Syndrome Center at Children’s Hospital at Montefiore in the Bronx, under the supervision of Dr. Sasha Djukic, and at Sheba Medical Center in Ramat Gan in Israel under the supervision of Dr. Bruria Ben Zeev. Each center will give copaxone to ten individuals for 6 months. Below is a comparison of the two studies. While copaxone is not going to cure Rett Syndrome we hope that by increasing BDNF we will see improvements in symptoms. The trials are currently recruiting. If you’ve been following RSRT’s activities then you know that one of the strategies we are pursuing is reactivation of the silent MECP2. We are adding Michael Green of UMass to our existing portfolio of labs who are working in this space. Dr. Green is taking a somewhat unconventional approach as he is attempting to reactivate the entire X chromosome and not just MECP2. His work first came to RSRT’s attention in 2009. We learned that he was conducting a screen to identify genes that control X chromosome inactivation (XCI). As his work matured over the next few years he did indeed identify factors that control XCI, some of which belong to molecular pathways for which there are drugs. These drugs can now be tested in culture and in vivo in the Rett mice models. Recently a paper from a colleague of Michael Green’s, Jeanne Lawrence, received enormous attention for doing the opposite of what Dr. Green proposes – inactivating the extra copy of chromosome 21 that causes Downs Syndrome (DS). While this work is not ready for prime time it is an exciting new avenue that could eventually make treatment for DS a reality. 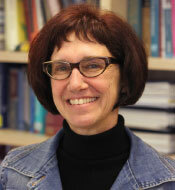 Continuing our X Factor focus we awarded an additional grant to Jeannie Lee of Harvard University. She is currently funded for a drug screen to reactivate MECP2. While the goal of the new award is the same – activate MECP2 – how she proposes to accomplish it is completely novel. The hypothesis of Dr. Lee’s approach rests on an observation that a group of proteins called Polycomb complexes working in concert with a certain type of RNA, called noncoding RNA (lncRNA) are relevant for keeping genes silent on the inactive X.
Dr. Lee’s therapeutic strategy is to awaken the MECP2 gene by disrupting the binding that occurs between the lncRNA and the Polycomb complexes. While the work is early stage, if Dr. Lee’s hypothesis proves correct this approach would be attractive. Last October David Katz of Case Western Reserve University published a paper showing that certain physiological symptoms in the Rett mice normalized after treatment with an aesthetic called ketamine. With RSRT funding Dr. Katz will continue to pursue this line of exploration with additional drugs that work in the same pathway but have less side effects. He will also attempt combination therapies with various drugs. Below is a video interview with Dr. Katz that was posted earlier this year. at a recent RSRT meeting. The final award was granted to Kevin Foust of Ohio State University. Dr. Foust has been working with Brian Kaspar and Gail Mandel on gene therapy approaches to treat Rett Syndrome. This award builds on that work by extending a gene therapy approach to the MECP2 Duplication Syndrome. Dr. Foust will deliver RNA interference (RNAi), a biological process in which RNA inhibits protein production) via a vector in duplication syndrome mice. If the data is encouraging this work would form the basis for a therapeutic approach to treating patients. This work is being funded via the MECP2 Duplication Syndrome Fund at RSRT and directly supported through the efforts of the duplication families. We look forward to bringing you updates on these and all of our projects. Once again we thank all of our supporters – this is your money at work for our girls. Guest blogger, Beth Johnsson, with her daughter Hannah. Someone once told me that hope is what distinguishes humans from every other species; our ability to look to a potential future rather than live solely in the here and now. This is, of course, wildly inaccurate; I am not a biologist or anthropologist (or any other ‘ist’ for that matter), but I believe there are a number of other factors which separate humans from the species around us (not least, an opposable digit!). But the concept has stuck with me and, since most of my life is built around hope, it cannot help but strike a chord. Sorry, that’s wrong, that is not what I hoped most of all. Most of all, I hoped, with every second of every appointment and of every minute in between, that one day none of this will be needed. I hoped that one day the ‘professionals’ involved in my little girl’s life will be her teachers, her GP and her dentist. And that’s all. Two weeks ago, the routine medical appointments were replaced by an unexpected admission to hospital. Her first. (What a strange world we now live in, where I know that making it through six years without a hospital admission makes us incredibly lucky). An infection, the source of which remains unknown, has made my cheeky and (hitherto) still mobile little girl, lethargic, disengaged, and unwilling to walk. Most worryingly, it has put out the sparkle in her eyes. Now the professionals involved reach an all-time high, as does my reliance on hope. I watch her suddenly unable to take a step on her own, trembling violently, and I cling fiercely, with muscles I didn’t even know I have, to the hope that this is not the beginning of regression, the start of a life time spent in hospital, but ‘just’ the temporary result of an infection. Something they do have a cure for. When Hannah was first diagnosed I didn’t know enough (and didn’t allow myself to know enough) about Rett Syndrome to understand that a cure was the only hope. Then, once I started to learn more, I didn’t allow myself to believe that a cure in her lifetime was possible. It seemed too fantastical, too far out of reach, to think it could really happen in time for my little girl. Now, as I continue to learn more about what Rett really means for Hannah, and about the research going on today, I realise that a cure is not only possible, it is the ONLY possible future. I cannot allow myself to think about the possibilities of the alternatives. Nor can I help but be frustrated and confused by those who don’t seem to share or, at the very least, support that hope. Why do ‘friends’ click ‘like’ on every trivial Facebook message out there, but ignore my posts about Rett? Why can they not take the time to vote when funding is at stake? Why can they not spare the cost of a skinny latte to help make the hope reality? Why do they so often seem to think that I should just accept how things are? Would they? I hope not! It seems to me that to accept is to admit defeat; to hope is to fight. If my hope was false, my fight for an impossible prize, I could understand why acceptance might be healthier, more practical, but it is not false. The prayer I offer every night is not one born of blind faith, for a miraculous thunderbolt from an omniscient being; it is one born of proven fact, for a miraculous breakthrough by a handful of knowledgeable scientists, supported by a group of dedicated parents, in whom my faith lies and on whom my hope depends. Perhaps others think I should accept because they wonder about the merits of a life based on hope, on a dream for the future. Carpe diem and all that? To be honest, sometimes I have wondered too. Shouldn’t we be living for today, enjoying what is here and now rather than always looking to a future which, ultimately, we cannot guarantee will arrive in time? But the two are not mutually exclusive, surely? In fact, I would say they are co-dependent. Living in hope for the future makes today more positive too: it enables you to notice the tiny, almost imperceptible steps being made forwards, the achievements which others might miss, but which you know are all part of the journey. Why should hoping for a brighter tomorrow preclude you from seeing the light in today? I don’t think it does; the light which research has switched on for Hannah’s future shines in her today too. It illuminates all the other reasons to be hopeful and grateful. When you are in darkness, finding the light switch is hard, so the darkness continues, self-perpetuates, the exit remains elusive. But when you have a little light shining already, no matter how small, finding your way towards the brighter, bigger light in the distance becomes an easier journey. Before we discovered Rett Syndrome Research Trust and the research they fund, the sense of helplessness was overwhelming. For a control freak, like me, it was impossible. Uncertainty about the future is bad enough, but feeling there is nothing you can do to change it is torture. Even fundraising didn’t feel truly hopeful, when ultimately we knew money was going towards coping with diagnosis, not in making that diagnosis a demon of the past. When I look back on that time, I remember a very dark place, not simply because of the diagnosis itself, but also because of our lack of vision of the future or of how we could influence it. Hopelessness for the future meant helplessness today. The relief that comes from feeling that you are actually doing something, that you are taking action, raising money, helping to fund the science which is holding all your hopes in its hands, this relief is a light switch. Since we turned it on, both tomorrow and today have seemed a great deal brighter. I started writing this, and thinking about hope, several weeks ago. Every time I think it’s done, something else comes along which is so tightly bound up with hope, some new experience or emotion which makes our hopes shift and metamorphose once more, that I have to start again. When I started writing, Hannah had never been in hospital overnight. She was walking confidently, progressing, even. She’d taken an independent step or two up the stairs. We were daring to hope she might continue. Now things have changed and with them, our hopes. Today we are hoping that she returns to where she was three weeks ago, now just that would be a little miracle. I’m sure all parents’ hopes for their children change over time, evolving inevitably as the child grows and develops their own set of hopes and dreams. I expected that. I just never thought that one morning I would wake up hoping that my six year old will bear her own weight. Everything is relative – our daily, weekly, monthly hopes change, but the ultimate hope is a constant, one of the few things in my daughter’s life which will not be lost. I started, all those weeks ago, by talking about what distinguishes humans from other species. Speech, surely has to be one of our greatest gifts. The very thing I hope for most for my daughter. I make a joke of the opposable digit, but the gift the thumb brings to us is the ability to grasp, to hold, to use our hands in ways which other animals cannot. Another fundamental skill my little girl has lost. It’s not that the loss of these things makes my daughter any less of a human being, but I cannot help but believe that it does make her a little less of Hannah: the little girl, teenager, woman she could be. I cannot know if Hannah has hope, whether she is aware enough of the things she cannot do to hope that one day she will, although the way she looks at her brothers playing and running and talking, it is hard to believe that she is not hoping to join them one day. If hope gives her the same sense of purpose and drive and determination as it brings the rest of us, then I hope that she does have hope, and that one of these days my stubborn, cheeky, sparkling little girl will tell me that her name is Hannah. Rett Syndrome doesn’t usually run in the family. Researchers led by Alessandra Renieri at the University of Siena in Italy encountered two exceptional cases: one pair of sisters with the same mutation in the Rett-causing gene MECP2, and a second pair with identical deletions within the gene. Despite having the same mutations in MECP2, the sisters represented the clinical spectrum of the disorder. For each pair, one sister had classical Rett Syndrome—she was unable to speak or walk or use her hands—while the other had a milder form of the disorder (called Zapella) and could talk using short phrases, walk and retained some hand function. Researchers describe these four women and possible genetic reasons why the severities of their symptoms were so different, in a PLOS ONE paper published a few months ago. It’s not surprising that girls with Rett Syndrome generally show a wide range of symptoms. That’s partly because a mutated copy of the MECP2 gene is located on only one of two X chromosomes in a female cell; the other copy is healthy. One X chromosome becomes inactive in each cell early in development. In rare cases when many cells express the healthy copy of MECP2, women show a milder form of Rett. 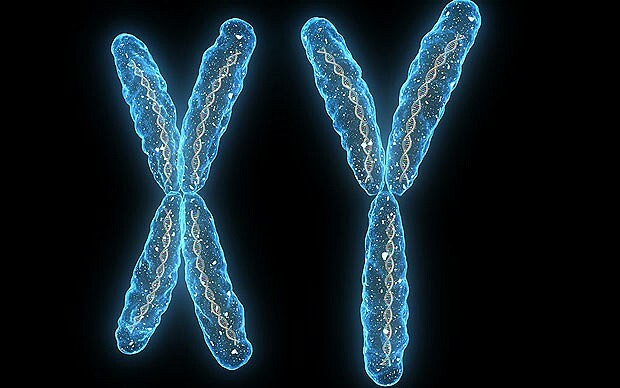 In the new study, however, both pairs of women were similar in how many of their maternally or paternally derived X chromosomes were inactivated, suggesting that something else might explain the differing severities of their disease. 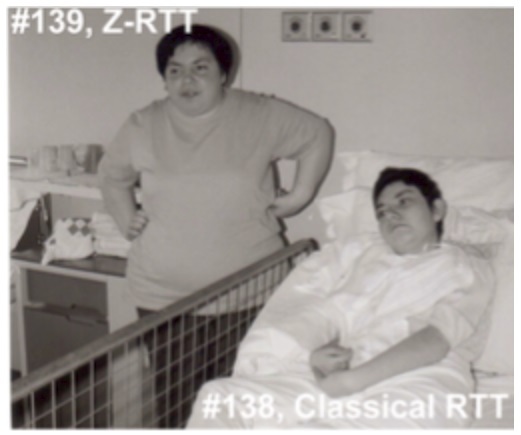 The team located 112 genetic variants on 108 genes that were exclusive to the women with classical Rett. A subset of these variations, about 10 to 20, is believed to be relevant to impaired protein function in Rett, based on what’s already known about them. These genes are involved in a range of functions. Interestingly, both women with classic Rett have variants on at least six genes that have been previously linked to oxidative stress. (The two people with Zappella had variants on three.) In a follow-up study, Renieri’s group found that the women with classical Rett, but not the two with Zappella, showed molecular signs of oxidative stress compared with healthy controls. But the link between MECP2 mutations and oxidative stress is still unknown, the authors note. The women with Zappella had exclusive variants in 80 genes, but none of these were shared by both. Some genes are linked to immune function, and the variants may be involved in protection from a more severe phenotype, says Renieri, a professor of medical genetics. Renieri’s group hopes to sequence the exomes of more people with severe and mild Rett Syndrome, to understand their genetic similarities and differences. It is easier to compare the genes of sisters because their genomes are 50% identical. But because sisters with Rett are so rare, they will need to compare unrelated patients, she says. I lost an old friend this week. Not in the idiomatic sense that he passed away, nor in the literal sense that I misplaced him in a crowded supermarket and never found my way back to him. Although, metaphorically, perhaps that’s exactly what happened: we lost each other in the crowded supermarket of life and by the time we realised we’d gone astray, there were just too many aisles and trolleys and shelves of tinned goods to find our way back. Of course, if I hadn’t been pushing a wheelchair maybe I’d have been able to keep up a bit better. Rett Syndrome is caused by a variety of mutations in the MeCP2 protein, but in some instances, MeCP2’s end is missing. A graduate student in Developmental Biology at the Baylor College of Medicine in Houston, Steven Baker, who is also in the medical scientist training program, was sifting through the clinical literature on boys with such mutations when he noticed that a tiny difference in how much of the protein’s tail is shortened—by just three amino acids—seemed to make the difference between decades of life (albeit with Rett-like deficits) and death in infancy. Baker asked his adviser, Huda Zoghbi, whether she thought those extra few amino acids could so dramatically change the clinical progression of Rett. So they did. One mouse had the end of its MeCP2 cut off at the 270 mark (‘R270X’ mice) while another’s protein was shortened at the 273 mark (‘G273X’ mice). The stories of these mice were reminiscent of the boys Baker had noticed. The R270X mice died prematurely, around the same time as mice with no MeCP2. In contrast, the G273X mice, with their extra three amino acids, survived longer and showed symptoms later, although these features became more severe and the mice died before healthy mice did. What do those amino acids do? In trying to find out, the scientists have refined their understanding of how MeCP2 works. Their results are published this week in Cell. Researchers know that MeCP2 binds throughout the genome, coating the DNA in neurons more heavily than in other cells, but what exactly it does after that is less clear. It’s thought to turn genes on or off, or alter the overall structure of DNA. Zoghbi’s team thought that the two truncated forms of MeCP2 might bind to DNA differently — in a way that would help explain the different clinical progressions of the boys — but when they initially looked at several spots within the genome they saw that both forms bound to those spots similarly. In fact, looking more broadly across the genome the group found that overall binding of the MeCP2 was pretty much the same, and it looked normal. (The latter wasn’t too surprising, though, because the front end of MeCP2 was already known to bind to DNA.) Both mutations also interfered with the normal ability of MeCP2 to repress genes. Looking more closely at gene expression at various time points in brain development, however, the group found a key difference in the two mutants: at 4 weeks of age, a small group of genes was improperly expressed in the R270X mutant but not in the G273X mutant. Interestingly, most of those genes eventually became misregulated in the G273X group by 9 weeks. Meanwhile, the scientists asked evolutionary biologist, Olivier Lichtarge, a Professor at Baylor College of Medicine who uses computational tools to study the evolution of protein sequences, to help them compare the sequences of the protein’s tail across different species (the idea being that any regions of the protein that were highly similar across species might be important for the protein’s function). “We worked with Angela Wilkins in the Lichtarge lab and asked, ‘Is there something in this domain that’s really unique?” says Zoghbi, who is also a Professor at Baylor College of Medicine. They found that three clusters of MeCP2’s tail were highly conserved across fish, frog, rat, mouse, and human. Shortening MeCP2 at the 273 mark removed the third of those conserved clusters, whereas cutting the tail at the 270 mark deleted the second and third clusters. What are these clusters in MeCP2’s tail and what do they do? It turns out that they’re called AT-hooks. In 2005, a study by Adrian Bird’s group described the first of those three AT-hooks (which is the one still present in both of Zoghbi’s new models), though its function was unclear. AT-hooks are regions of a protein that are already well known to bind DNA, however, so the team went back to the idea that the two truncated proteins might differ from one another in how they attached to the genome, even though their initial results had shown that binding was similar. Using a different assay, they found that missing the second AT-hook domain impaired the ability of the R270X to steadily interact with certain sequences in the genome. Our genomes are wound tightly around spool-like proteins called histones; the DNA and histones (together, called chromatin, which looks like beads on a string) are then packed in even more so that it can all fit inside cells. Using an experimental model of compaction in vitro, the team found results suggesting that R270X mice (which, remember, are missing an two AT-hooks instead of one) don’t pack up chromatin as well as 273X mice do. The initial finding that both mutated forms of MeCP2 bind to DNA are still important though, Zoghbi says. “It tells us that the major binding to DNA happens. That’s the first step.” The researchers think that once the front end of MeCP2 sits on DNA, the AT-hook clusters on its tail come in manipulate the DNA further, likely bending or altering the structure to help it pack further into the cell. “There were hints previously that MeCP2 might cause a change in the overall conformation of DNA. The new study is probably the most direct evidence,” says Howard Hughes Medical Institute Investigator Gail Mandel, at the Oregon Health and Science University in Portland, who was not involved with the study. When the MeCP2 sits on DNA, and likely alters the way it packs into a cell, there are other molecular partners that come and join it. One of those is the protein ATRX—whose mutations have been linked to Alpha-thalassemia mental retardation syndrome—and Adrian Bird’s lab has previously shown that its interaction with DNA is disrupted in mice missing MeCP2. Zoghbi’s team decided to look at this protein in their new mutant mice. Studying female mutant mice that are missing a copy of MeCP2, the researchers found those brain cells with no MeCP2 also had less ATRX bound to tightly packed DNA compared to controls. In female mutants with too much MeCP2, an excess of ATRX latched on to DNA. 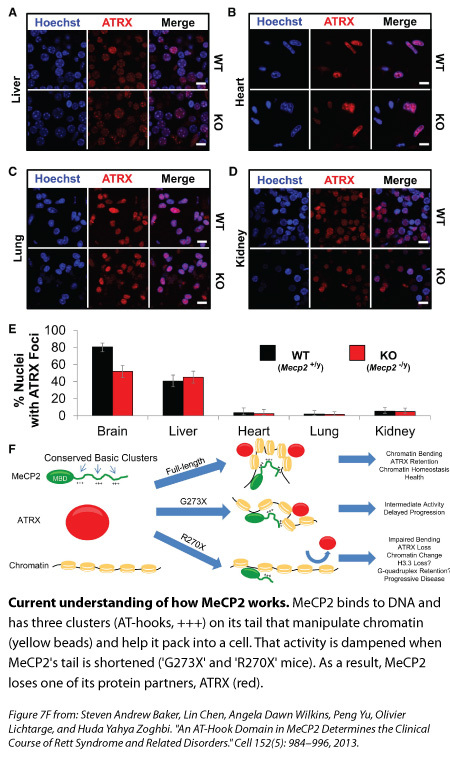 MeCP2’s absence from liver and non-brain organs didn’t affect ATRX binding in those organs, suggesting that MeCP2 has a mechanism that’s specific for the brain. Taken together, these results suggest that in the brain, the AT-hook clusters on MeCP2’s tail are manipulating DNA in a way that’s crucial for the other protein partners to bind and do their jobs, Zoghbi says. Zoghbi’s team hopes to understand how shortening MeCP2’s tail changed chromatin structure without dramatically changing gene expression — as well as the mutation’s affect on brain activity. They also plan to do biochemical and molecular experiments to figure out where ATRX is going and what it’s doing when its distribution is altered in the brain cells of the MeCP2 mutants. This past November in a peaceful New York City suburb, twenty-eight scientists gathered for a three-day meeting organized and sponsored by RSRT. 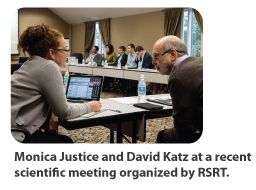 In the age of email and Skype and webinars and GoToMeeting and a plethora of ways to connect people from across the world with a click of a mouse why does RSRT spend hard-earned money to bring scientists together for face-to-face meetings? I’ve organized dozens of scientific meetings since 1999. In recent years I’ve come to favor small, invitation-only meetings on clearly defined topics, hosted in quiet locations far away from distractions. I find that more intimate and focused meetings catalyze deeper discussions and are better equipped to ensure participants of confidentiality, allowing them to share data long before publication, a process that can unfortunately take many months and sometimes years. The success of a meeting is measured in part by how effectively the exchange of ideas, scientific tools and ensuing projects and collaborations move the field forward. It may take considerable time for the impact of a meeting to be known. Sometimes, however, success is instantaneous, with collaborations initiated before the meeting has even concluded. The concept for the modifier screen currently underway in the lab of Monica Justice, in which we have invested $1.5 MM, was born at a meeting I organized a number of years ago. The MECP2 Consortium evolved from interactions between Gail Mandel, Mike Greenberg and Adrian Bird at our science meetings over the last decade. As the Rett/MECP2 field has matured, so has the nature of the science meetings. This year we heard a large number of presentations with clinical relevance; that certainly was not the case even a few short years ago. Where will the research take us in the next few years? I can’t wait to find out. View our Facebook album to see all the pictures from the meeting and to put names to the faces. For almost 15 years now, I’ve been immersed in the science behind Rett Syndrome. As Executive Director of RSRT I understand that the work is methodical, that good research takes time, that breakthroughs often come after many tiny, incremental steps. And yet, as a mother witnessing my 16-year-old daughter deteriorate a little more each year, I feel a great urgency to push the research harder and faster. All families with intimate, daily experiences of Rett Syndrome’s harsh rule know the longing for their children to be free and well. RSRT is one-hundred-per-cent focused on that ultimate goal – and that’s what guides our choices about where to invest not just our hard-won funds but our hopes and dreams. 2012 gave us reason to be hopeful. We are grateful for the active engagement of our trustees, the unwavering commitment of the families who fundraise for us and the generous contribution of a wide range of people who give their time and talents freely to help us achieve our goal. We wouldn’t be where we are without the unique global partnerships that we enjoy with Rett Syndrome Research Trust UK and the Rett Syndrome Research & Treatment Foundation (Israel), and with national organizations such as GP2C, Kate Foundation, RMRA. Together you have produced an investment in science that will create a better future for our children. But that future won’t just happen. Before Rett entered my life, I had never given much thought to the drug development process. Like most people, I assumed that academic scientists, industry and government worked together seamlessly to discover effective therapies for the horrible ailments that afflict us. Nothing could be further from the truth. There is no “Department of Cures.” Laboratory breakthroughs don’t naturally bubble up and become drugs. The reality is that progress must be relentlessly driven, managed, nurtured and prodded, not to mention funded. It’s a messy, difficult and expensive process that can be slowed and derailed by a multitude of hurdles. Disease-specific organizations such as RSRT cannot afford to be spectators, passively reviewing proposals and granting money. It is incumbent on us to set the research agenda and to facilitate its execution while staying nimble and vigilant to new opportunities. Two such opportunities would not currently exist without RSRT: reactivating the silent MECP2 on the inactive X chromosome, and gene modifiers. Following the 2007 reversal, RSRT carefully evaluated the state of Rett research and made the decision to champion these explorations before others had even realized they were, in fact, promising approaches. Will they lead to a cure? Ongoing research and clinical trials will tell. But in the meantime, RSRT will continue to encourage and support the research that holds the greatest promise to truly change our daughter’s lives. For we have the most to win if we succeed, and the most to lose if we fail. There is no mystery about why a girl suffers from Rett Syndrome. The cause is that mutated copy of the MECP2 gene inhabiting her every cell. But since MECP2 is on the X chromosome and all females have two X’s, beside each mutated gene rests a healthy but silenced twin. What if we could replace the flawed gene with its perfect counterpart? That’s the question Ben Philpot of the University of North Carolina at Chapel Hill has asked. RSRT has awarded Philpot, Bryan Roth and Terry Magnuson $2.2 million to answer it. Philpot’s recent paper in Nature describes successful reactivation of the silenced gene in Angelman Syndrome, demonstrating that replacement is possible. Joining Philpot and Roth in this effort is Terry Magnusson, a world-renowned leader in X-inactivation. The award will fund a team of three full-time post-docs and two technicians. Advancing lead candidates into preclinical trials. The project will be milestone-driven, with a set of pre-established deliverables. This will allow us to monitor progress utilizing a team of advisors with relevant expertise. Interview with Benjamin Philpot Ph.D. from RSRT on Vimeo. Along with activating the silent MECP2, RSRT has championed a second exciting approach. In her Baylor College of Medicine laboratory, Monica Justice set out to identify modifier genes – altered genes able to dampen the ill effects of an MECP2 mutation. The common belief has been that these genes would be hard to find. The reality? With the screen just 15% complete, Justice has already found five. What she is seeing in mice implies that Rett-like symptoms are unstable, and consequently easier to revert to a normal state than anyone had suspected. None of the modifier genes can suppress the disease entirely, but each reduces a subset of Rett-like symptoms. While we had originally thought that the modifiers were specific to the central nervous system, it turns out they may operate elsewhere in the body. At least one of the modifiers suggests an alternative therapeutic target, using drugs already FDA-approved. With RSRT funding Justice is now testing the drugs in mice and has a manuscript currently under review. A clinical trial is being explored. At RSRT we’re excited about will happen once the screen is completed. Justice is likely to find many more modifiers, some of which may point to tractable pathways. In support of this goal, RSRT has committed an additional $800K to the Justice lab, bringing its total commitment to the modifier screen to $1.5 million. This funding should provide sufficient resources to allow Dr. Justice to reach the 50 percent mark in the screen within two years – at which point she will propose a plan to us for completing the project. Many more modifiers await discovery. Further surprises are likely in store. 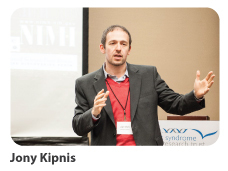 We have also awarded funding of $720K to the lab of Jonathan Kipnis at the University of Virginia. Kipnis and colleagues hope to gain better understanding of the immune system’s involvement in Rett by analyzing patient blood. The hope is that immune-based therapies can be developed. Previous work from the Kipnis lab suggested that bone marrow transplants could be beneficial. Before proceeding to clinical trials with a procedure that is extremely serious and risky, RSRT committed funding in 2012 for independent corroboration of these findings. We are also supporting Huda Zoghbi’s work to explore whether symptoms of the MECP2 Duplication Syndrome can be reversed once the protein level is normalized. $236K was awarded to this project via the MECP2 Duplication Syndrome Fund through the fundraising efforts of the duplication/triplication families. 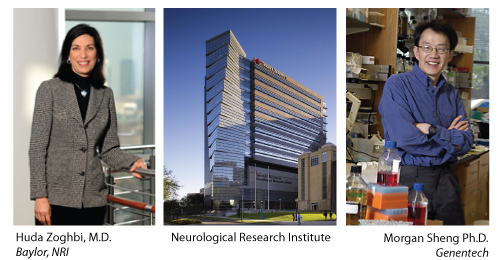 RSRT is supporting work at John Bissonnette’s lab at OHSU (Oregon Health & Science University) to explore serotonin 1a agonists for their ability to reduce apneas, and Andrew Pieper’s lab at UTSW (University of Texas – Southwestern) for ongoing drug screening. Finally an award of $65K was made to Dr. Sasha Djukic for her work at the Tri-State Rett Syndrome Center in the Bronx, NY with the majority of the funds coming from the annual Reverse Rett NYC event. Please join me in wishing all of our scientists Godspeed. I look forward to keeping you apprised of their progress. One last heartfelt thank you to everyone who raises research funds for RSRT. These projects are your money and your effort at work. That mutations in the MECP2 gene cause Rett Syndrome has been known for over a decade. But what exactly the protein does is not yet clear. “[The study is] a very interesting new development in studying the functional significance of MeCP2, which we have to understand if we’re going to understand Rett Syndrome,” says Bird, professor of genetics at the University of Edinburgh in Scotland who was not involved with work. Abundant in the DNA of certain brain cells, 5hmC seems to be a signpost of sorts for active spots within the genome — that is, the regions that are churning out new protein — the study found. MeCP2’s latching onto these sites supports its potential role as a gene activator, though it’s clear that the case of what MeCP2 does is far from closed. “Whether or not [MeCP2 is] directly involved in activation is still a matter of further investigation. But we know that it can localize to a region that contains 5hmC and active genes,” says Skirmantas Kriaucionis, group head in the University of Oxford Nuffield Department of Medicine, who co-led the study with Nathaniel Heintz of the Rockefeller University in New York. As a postdoctoral researcher in Heintz’s lab, Kriaucionis found 5hmC in 2009 by accident when he was looking at how a closely related chemical, 5-methylcytosine (5mC), influences genome structure in brain cells. Anjana Rao’s group, then at Harvard Medical School, working independently from Heintz’s lab, confirmed the existence of 5hmC in the same issue of the journal. Researchers consider 5mC a fifth base, and 5hmC a sixth base, of DNA, which is traditionally thought of as a string of four different chemicals called nucleotides. 5mC and 5hmC resemble the traditional base cytosine, but with a methyl group added on, making 5mC, and a hydroxy group added to the methyl, creating 5hmC. The new study confirmed that patterns of these chemical modifications to the genome are different in each cell and influence which genes are turned on or off and when. The discovery of 5hmC opened up a new area of work—and hundreds of new papers—focused on where the nucleotide is in the genomes of different cell types, and what it’s doing. In the new study, using an explorative molecular assay to fish for a binding partner for 5hmC, the group identified the molecule as MeCP2, and nothing else. “It was really a surprise,” Kriaucionis says. “This paper is the second paper to suggest a candidate binding protein for 5hmC,” says Rao, now a professor of signaling and gene expression research at the La Jolla Institute for Allergy and Immunology, who was not involved with the new study. Other findings have proposed a different molecule, MBD3, as a candidate, but those and the new results need further investigation, she adds. “So far, both candidates — MBD3 and MeCP2—also bind 5mC, so an exclusive binding protein for 5hmC has not yet emerged,” Rao says. Indeed, contradicting the new evidence that MeCP2 binds 5hmC and 5mC equally, some previous studies show that MeCP2 much prefers binding to 5mC over 5hmC. For example, a study published earlier this year shows that says MeCP2 is nearly 20 times more likely to bind 5mC than 5hmC. In the new study, Kriaucionis and his colleagues observed that a certain Rett-causing mutation, called R133C—which is responsible for a relatively milder form of the disorder—disrupts MeCP2’s binding to 5hmC. “[The R133C mutation] is really interesting because it allows us to speculate that MeCP2 binding to 5hmC is important as a part of the function which causes Rett Syndrome,” Kriaucionis says. The evidence now “strongly suggests” the potential involvement of 5hmC in Rett, says Peng Jin, an associate professor of human genetics who was not involved with the new study. A study his group published last year in Nature Neuroscience found that patterns of 5hmC are altered in mouse models of Rett. Interestingly, the R133C mutation only slightly dampens MeCP2’s interaction with 5mC, suggesting that MeCP2’s binding with 5mC serves a different purpose than that of MeCP2 and 5hmC. Other Rett-causing mutations in MeCP2 examined by the group don’t seem to affect binding to 5hmC, meaning 5hmC binding does not fully explain the symptoms of Rett. “It will be important to test further the contribution of 5hmC to Rett Syndrome,” notes Jin, adding that there are mouse models available to do so. Those mutant mice lack the enzymes needed to convert 5mC to 5hmC. In the new study, researchers studied only a few types of neurons, but there are hundreds of cell types in the brain. Kriaucionis thinks that MeCP2 binds to 5hmC in other cells. The 5hmC patterns themselves are cell-specific, however, perhaps further complicating the story of MeCP2. “We really need to get more data to understand whether or not, how different 5hmC and MeCP2 localization would be in different cell types,” Kriaucionis says. “It’s an important component to understand MeCP2 function,” and how scientists might think about future treatment. In September of 2011, RSRT met with the National Institute of Neurological Disorders (NINDS) and other public and private organizations that fund Rett Syndrome research to discuss crucial knowledge gaps in the field. The main findings of the workshop were published recently in Disease Models & Mechanisms. 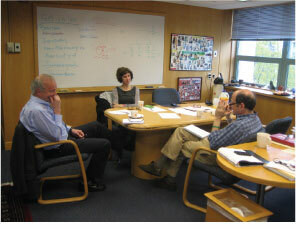 In particular, the meeting focused on how the research community can improve its chances of success in clinical trials. Preclinical studies require a huge investment of time and effort studying disease in rodent models. Even then, for a variety of reasons, drugs that show promise in preclinical studies will often fail in the clinic. Here are a few big hurdles in preclinical animal studies — some that are specific to Rett research — and how experts are meeting those challenges. 1. Studying female mouse models of Rett. “It’s important that when we do a drug trial, that we really impact features that are clinically meaningful, features that are going to impact patients,” Huda Zoghbi of the Baylor College of Medicine in Houston, Texas, told RSRT in a recent interview. Like girls with Rett, however, female mouse models of the disorder vary in the type and severity of their symptoms, which makes them harder to study than males. That’s because the gene missing or mutated in Rett, MECP2, is located on the X chromosome. Female mice — which, like girls, have two X chromosomes, only one of which is active — will have either mutated protein or normal protein levels, depending on which copy is expressed in the cell. Rarely are they missing all of their MeCP2 protein. In contrast, male mouse models missing the Rett gene have no protein at all. Although these mice have paved the way in understanding the protein’s role in the brain, when it comes to treating Rett, results from studies of male mouse models may not be the ideal model to work with. More researchers are turning to female mouse models. 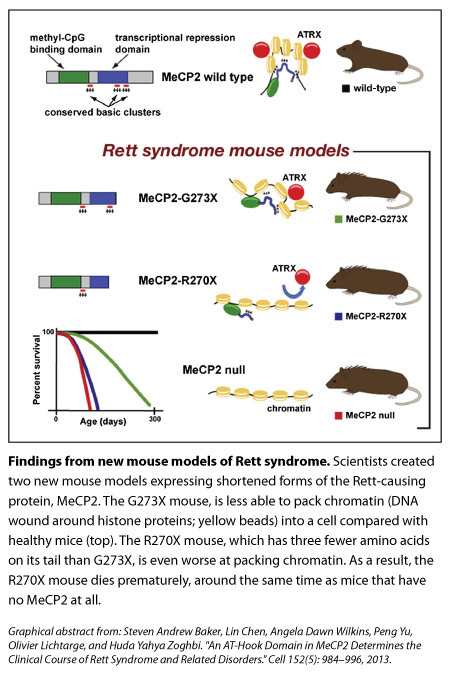 Zoghbi and Rodney Samaco, also at Baylor, for example, published a study in October in Human Molecular Genetics, describing two different female mouse models of Rett in detail. Detailed characterization of these mice will help lay the groundwork for preclinical studies. 2. Unknowns about how an animal’s environment affects therapeutic efficacy. No two research labs are alike. The ways in which they differ, including animals’ access to food, housing, lighting or other environmental factors, might well influence an animal’s response to a drug. What’s more, an individual mouse’s genetic environment — meaning the genetic background on which Rett mutations are made — affects some of its symptoms, such as obesity and abnormalities in social behavior. These genetic differences may also affect how animals respond to treatment. Variability in genetic and environmental conditions plague scientists studying many conditions, not just Rett syndrome. One way to help address this obstacle, according to Rett researchers in the Disease Models & Mechanisms workshop summary, is to study symptoms and potential therapies across a variety of models and in many lab settings. Those mouse models that show consistent results across different environments will be most useful for translational studies. 3. Recapitulating speech problems in mice. Of the many symptoms seen in Rett, loss of speech is among the most challenging to study in a mouse model. Some groups have shown that Rett mouse pups produce unusual vocalizations when they’re separated from their mothers in early postnatal life. These sounds are either more or less frequent than in healthy controls, depending on the mouse model studied. Future work will need to sort out these conflicting results and identify a mouse model that best captures this hallmark symptom of Rett, researchers say. 4. Avoiding bias, which can prevent preclinical errors. Unintended biases can creep into animal studies. This can lead researchers to conclude a treatment is effective when it isn’t, or it can cause overestimations of a drug’s efficacy. And how data is handled, for example, deciding on study’s primary endpoints, or how to handle missing data points or outliers, before starting the study. Not reporting such details has, in the past, been linked to overestimations of therapeutic efficacy, according to the NINDS report. Now Rett researchers have added their voices to the mix in the Disease Models & Mechanisms report, voicing their support of NINDS’s recommendations and emphasizing the need for rigorous experimental design. In January of this year a gentleman who has a granddaughter with Rett Syndrome introduced me to his neighbor, David Scheer, a 31-year veteran of the life sciences industry. I was eager to meet David, whose entrepreneurial focus lies at the intersection of finance and science. Our planned hour of conversation turned into a three-hour discussion as we delved into David’s network, experiences, and the potential synergies we might explore. Over the past 9 months I’ve come to rely on David’s insights, perspective and advice. I’m delighted that he has agreed to serve on RSRT’s Professional Advisory Council and look forward to working closely with him on our drug development strategies. MC: David, please start us off by telling us a bit about your background. DS: I began with an undergraduate degree in biochemical sciences from Harvard and went on to study cell and molecular biology and pharmacology at Yale. While in graduate school during the early 80’s, I started doing consulting work in the emergent fields of molecular biology and biotechnology. This became a life sciences consulting practice that brought together venture capital, transactional advisory services, and corporate strategy. Scheer & Company is best known for having launched a series of companies spanning the fields of infectious disease, cardiology, oncology, and neurology, to name a few. We’ve had some pretty significant successes among the entrepreneurial enterprises we have launched and built. One of our companies launched a product that was ultimately acquired by Johnson & Johnson; another, a company called Esperion Therapeutics, developed a product in HDL (good cholesterol) therapeutics which was sold to Pfizer in 2004 for $1.3 billion. In the roles of founder and director of numerous companies, I have been involved in identifying technology, recruiting people and raising capital. In most of my more recent companies, I have served as Chairman of the Board. MC: David, one of your companies, Aegerion Pharmaceutical, operates in the ultra-orphan disease world. Can you tell us a bit about that company? DS: Aegerion has developed a drug for a very rare disease present in only one in a million people: Homozygous Familial Hypercholesterolemia (HoFH). The disease causes very high bad cholesterol that confers high risk for cardiac events like strokes or heart attacks, even in individuals as young as teenagers, for those who are untreated. We are pursuing approval with both FDA and European regulatory authorities, and we have put in place management and commercial infrastructures in the US and Europe to make the drug available to patients in need, when there is the proverbial regulatory green light. As Chairman of the Board of this company, I have become quite interested in the area of rare diseases. MC: Lately, pharmaceutical companies seem to all be starting rare disease initiatives. This is in stark contrast to the traditional focus on blockbuster and “me-too” drugs. What is driving this change? DS: The traditional view has been if there are not enough patients, it’s not really worth developing a drug. However, pioneering companies such as Genzyme, BioMarin, and more recently, Alexion, have successfully developed life-saving drugs to treat rare diseases while providing a return on investment for their shareholders. In so doing, they have opened the eyes of people in the pharmaceutical industry. This shift holds clear potential for organizations working toward the development of therapies for rare diseases, such as the Rett Syndrome Research Trust. I suspect that rare diseases may also provide an easier path for drug approval. Much of the cost of drug development comes at the end, during the extremely large and expensive clinical trials that are needed for blockbuster drugs. In the rare-disease space, due to the small population sizes, trials will be much smaller, and therefore less expensive. Also, the regulatory process may be fast-tracked for a rare disease, as the FDA recognizes the enormous unmet need and cooperates with sponsors and patient advocates to provide new agents sooner. So interest in innovation in the rare disease category has turned bullish, which makes this an exciting time for someone engaged in your work, Monica, and frankly also for people like me who are really interested in efficient and effective development of new drugs. MC: Are large pharmaceutical companies set up to tackle drug development for rare diseases? DS: I think the answer depends on the drug company. The bulk of the rare-disease experience in drug development has traditionally come from innovative smaller companies. For example, Genzyme, which started off as an idea on the back of an envelope, became a multimillion-dollar pharmaceutical company with a large number of products in its portfolio, and was recently acquired by Sanofi-Aventis. Sanofi now has a franchise that is very capable and active in the rare-disease field. Other companies have either built from scratch, made smaller acquisitions, or are making partnerships or deals with companies that have assets or programs in rare-disease drug development. Pfizer and GlaxoSmithKline have done this, and both now have rare-disease units. I think it is too early to predict the success of these larger companies. Can the big companies be as effective as some of the smaller companies have been? Will the entrepreneurial spirit of a Genzyme in the early days be retained or lost as part of a larger company? We shall see. MC: How do FDA drug reviews for a rare disease differ from those for a common one? DS: The FDA has really had to modify its approaches to adapt to the needs of the rare-disease community. In fact, there is an orphan-disease unit within the FDA that is specifically tasked to review rare-disease drugs. These people are very familiar with how to evaluate a drug through a very different lens than is ordinarily used. It is important to keep in mind that regulatory decisions are always based on a favorable risk-benefit relationship. MC: The Rett community, including families, clinicians and researchers, is highly concerned—-and properly so—with rigorous validation of pre-clinical advances and the complexities of developing solid protocols for outcome measures. Though Rett patients are a small population, the range of symptoms is staggering, so there are many issues to address. DS: There are no perfect drugs – even Tylenol can have dreadful side effects if taken in excess, such as liver failure. The FDA must balance the solemn task of making available new and important therapies, while ensuring that such agents demonstrate safety and efficacy commensurate with the condition being treated. MC: You were only recently introduced to Rett. What have you found most interesting thus far? DS: That it has attracted some very talented individuals. The scientists, thought-leaders, and patient advocates involved in Rett Syndrome research represent an incredibly impressive group. Perhaps this is because Rett Syndrome is believed to be scientifically very tractable. It certainly helps that it is a single-gene disorder. The number of chronic conditions that can be attributed to a single gene is relatively low. So if I may say this, those in need of therapeutics for Rett Syndrome, may be fortunate in that there is an important foundation for discovery of potentially novel, disease-modifying therapeutics. MC: I think the 2007 proof-of-concept reversal has also helped put Rett on the map; it had been a much more obscure disorder before that breakthrough. DS: I agree. Each year in my not-for-profit work, I organize and chair a conference in New Haven, in conjunction with Yale and the Long Wharf Theater, called Global Health and the Arts,. For the past four years, this conference has promoted examination of important disease topics in public health and global health. This past May, we explored the neuropsychiatric disease arena. We had a major scientific symposium, with some of the most well known academic and industrial thought leaders from around the world, who were able to give us an update on relevant areas of science and technology, drug development, genetics, genomics, and translational medicine. In the middle of this event we actually had several individuals comment on the importance of the work being done in Rett and related disorders. Monica, you need to continue doing what you do so well: ensure you have the best information from scientists at the cutting edge of this field, and then position that knowledge in a way it can be most effectively translatable. The more quickly drug development gurus can bring their expertise to the table, the better the chances of a successful outcome. I am very much looking forward to help you achieve that success. MC: Thank you, David, and on behalf of every Rett family, welcome. Ever wondered why most labs use male Rett mice for their experiments even though the females are the better model? What human symptoms are replicated in the Rett mice? What are some of the surprises these mice have in store for us? What are the complexities of doing well-designed and executed trials in mice? What are some of the pitfalls that the Rett field needs to avoid? What is the potential for the newly unveiled Rett rat? Listen and find out…. RSRT has an amazing opportunity over the next 2 weeks to show the internet community the importance of Rett Syndrome research. We have been nominated for a $250,000 grant, and need your support to win. Any Facebook user, anywhere in the world, can vote. Voting is open from 9/6 through 9/19. This is not a daily vote. BONUS VOTE: Share a link to the Chase Community Giving app on your FB timeline and if a friend links back to the app and casts a vote of their own you will earn an extra vote. SPREAD THE WORD: Ask your friends, family, neighbors and co-workers to vote, too! CHASE CUSTOMERS: You have 2 extra votes. Just go to Chase.com/ChaseGiving, log in, search charities, and cast your ballots! The charity that gets the most votes over this two-week period will win the money – funds that will be immediately invested in RSRT’s research projects. It’ll take a few seconds of your time – and could make all the difference. It would be difficult to overestimate the importance of what we have learned from the mouse models of Rett Syndrome. After all, without them we would not know that Rett is reversible. It may come as a surprise that there is no single mouse model of Rett but rather a variety of genetic models, from “KO” or “knock-out” mice, which have no MeCP2 at all, to those in which the precise MeCP2 mutations that are seen in humans suffering from Rett Syndrome have been duplicated. Jackson Laboratories in Bar Harbor, Maine currently distributes almost a dozen mouse models of Rett. Jackson (or Jax, as most scientists refer to it) is a non-profit organization that specializes in this work to advance the understanding of human disease. Although no animal model perfectly capitulates human symptoms or responses, 95% of our genomic information exists also in rodents. Maintaining an extraordinary level of care and attention to detail in this sensitive field, Jax conducts its own research as well as breeding and managing colonies of thousands of models. To learn more about Jax please read an earlier blog post, Of Mice and Men…Or in the Case of Rett…Of Mice and Women. Having access to the various models of Rett Syndrome is crucial to the advancement of research and this is an area that RSRT and its predecessor, RSRF, have been actively involved in since the first animal models were published in 2001 by RSRT Trustee and advisor, Adrian Bird and by Rudolf Jaenisch. From the Jax website: “Partners in the fight against Rett syndrome,” a story about how Monica Coenraads, the mother of a daughter with Rett syndrome and co-founder of two organizations focused on treating it, is working with Dr. Cathy Lutz to develop and distribute new mouse models of Rett syndrome. Sharing mouse models is not always the norm as this article about a mouse model for Angelman Syndrome illustrates. We are extremely fortunate that researchers in the Rett field have been stellar about quickly sharing their models. Adrian Bird, Rudolf Jaenisch and Huda Zoghbi have set an exemplary high bar when it comes to making their own mouse models available as soon as they publish. In some cases sharing the mouse has even preceded publication. Last year Nature reported on a situation regarding a Rett mouse that had been developed by Novartis. The model had been engineered so the Rett protein glowed so it could be tracked visually. Many researchers were eager to access the model but could not due to legal issues. (Nature article – Licence rules hinder work on rare disease. Animal model off-limits to Rett syndrome researchers.) I knew that Adrian Bird after being denied access had created his own model and I asked him whether he would be willing to share it through Jax. He agreed immediately even though he had not published yet. The mouse is now available to any researcher worldwide that needs it. Besides teaching us about the molecular underpinnings of disease, mouse models may be effective to test treatments. We have all heard many stories about how drugs tested in mice with success are found to be ineffective in humans. The next few years will be extremely interesting as we begin to explore how predictive the Rett mice models really are. Adrian Bird and colleagues recently published their latest paper on MeCP2 in the journal Human Molecular Genetics. The series of experiments described in the paper were designed to explore what happens when the MeCP2 protein is removed from mice of various ages, including in a fully adult mouse. This work was funded in part by RSRT with generous support from RSRT UK, Rett Syndrome Research & Treatment Foundation (Israel) and other organizations who financially support our research effort. Below are excerpts from a conversation with joint first authors Hélène Cheval and Jacky Guy. MC Dr. Cheval, you trained as a neuroscientist. What attracted you to the Bird lab, which is very biochemistry-based, and where you are the sole neuroscientist? HC My previous lab, run by Serge Laroche, was a pure neuroscience lab focused on learning and memory. However, I was actually doing biochemistry and I was very much interested in how to get from molecule to behavior, and I was also quite interested in chromatin. I had read the Bird lab reversal paper of 2007 and thought it was one of the most exciting papers I had ever seen. Upon receiving my PhD I applied for a post-doc position, convinced that it would be a great experience for me but also thinking that perhaps the lab would benefit from having someone with a neuroscience background. I joined the lab in 2009. MC Dr. Guy, you co-authored your first paper on Rett Syndrome in 2001. That was the paper that described the MeCP2 knockout mouse model made in the lab, one that is now used in hundreds of labs around the world. JG I joined the lab in 1997. My first project was to make the conditional mouse models of Mecp2, meaning mice where the protein can be removed at will. At that stage we didn’t yet know about the link between MECP2 and Rett Syndrome. That came about as I was working on the project. It was a very exciting time. MC It’s unusual for people to stay in a lab so long. This gives you an amazing depth of uninterrupted knowledge about the field. JG I took a rather unconventional path. I’m very happy to do bench work and being able to work in the same field has been wonderful. MC Dr. Guy, perhaps you can start us off. What are the key questions you were trying to answer with this series of experiments? JG This was actually an experiment we had been wanting to do for a long time. We have always been interested in defining when MeCP2 is important. Rett had been thought of as a neurodevelopmental disease. Since we were completely new to Rett, we thought maybe it’s not neurodevelopmental. So we set out to remove the protein at different ages and see what happens. Removing the protein is not quite as simple as reactivating the gene, which we had already done in the reversal experiment. When you reactivate the gene it makes protein right away. In this experiment, however, when you deactivate the gene you have to wait for the protein to decay away. We found it takes about two weeks for the amount of MeCP2 protein to fall by half. HC Jacky’s reversal experiment suggested that MeCP2 is implicated in adulthood. But many papers were still describing Rett as a neurodevelopmental disease. We also wanted to confirm a hypothesis that we all shared in the lab that MeCP2 is required throughout life. MC That is a hypothesis that was also put forth in Huda Zoghbi’s 2011 Science paper. 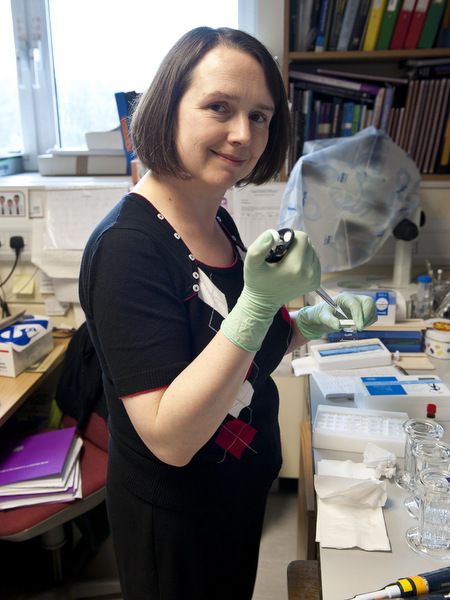 She showed that removing Mecp2 in adult mice aged 9 weeks and older caused Rett symptoms. Do you think that her paper and your new data have definitively put to rest the notion that Rett is neurodevelopmental? HC To my mind it’s clear that it’s not merely neurodevelopmental. JG I think “merely” is the key word here. The phenotypes we analyze in mice are those that are quite easy to see; for example, lifespan, breathing, gait. There might be more subtle things that we are not observing, or that are not affected by knocking out the protein in adulthood. And we are not analyzing cognitive aspects. So we can’t completely rule out the possibility that there could be some things that are indeed of a neurodevelopmental origin that we are not seeing in these experiments. JG Mecp2 can be deleted by treating the mouse with tamoxifen in the same way the protein was reactivated in the reversal paper. In this paper we picked three different time points to turn off the gene: three weeks (which is when mice are weaned and begin to live independently) eleven weeks and twenty weeks. In all three scenarios the tamoxifen was able to delete Mecp2 in about 80% of the cells. What you might expect is that at whatever age you delete the gene, there will be a certain amount of time for the protein to disappear and then the effects of not having the protein will appear. In fact, what we found is that the time it took for symptoms to appear varied with the age at which we inactivated the gene. It took longer for the symptoms to appear when we deactivated Mecp2 at 3 weeks. When we removed MeCP2 in older mice, the symptoms appeared more rapidly. So it seems that younger mice are able to live symptom-free without MeCP2 for a longer period of time. There is a certain period when the need for MeCP2 becomes more important in mice. This is the first critical time period that we talk about in the paper; it happens around eleven weeks. As we followed the mice treated at all three time periods, eventually they all started to die at about the same age, approximately thirty-nine weeks, regardless of when MeCP2 was removed. We concluded that this time period centered around thirty-nine weeks represented a second critical period for MeCP2 requirement. This is a time in a mouse that roughly coincides with middle age in humans. We think that maybe MeCP2 is playing a role in maintaining the brain as it ages. Interestingly, this time frame of thirty-nine weeks is when female mice that are MeCP2-deficient in about 50% of their cells from conception begin to show symptoms. The male mice which have zero MeCP2 can’t make it past the first critical time period of eleven weeks. When you delete MeCP2 in 80% of the cells, the male mice show symptoms at 11 weeks and die at 39 weeks. So having about 20% normally expressing cells allows you to survive the first critical period but not the second. MC I’ve heard clinicians say that women with Rett in their 30s and 40s and beyond look older than they are. I wonder if this has anything to do with your hypothesis that MeCP2 may play a role in aging. Of course we don’t know if the premature aging is primary or secondary. It may have to do with the effects of dealing with a chronic illness for many years. JC We are quite interested to learn about a potential late deterioration in women with Rett but there is very little published on the subject. MC There are two potentially critically relevant points made in your paper. One is the fact that the half-life of the MeCP2 protein is two weeks. That could be relevant and encouraging for a protein replacement approach. JG We certainly had this in mind when we were doing the experiment. The half-life of MeCP2 is longer than we expected. And could in fact bode well for protein replacement therapy. One caveat, ours was a bulk brain experiment. It could very well be that if you looked regionally in the brain or by cell type you might find varying results. 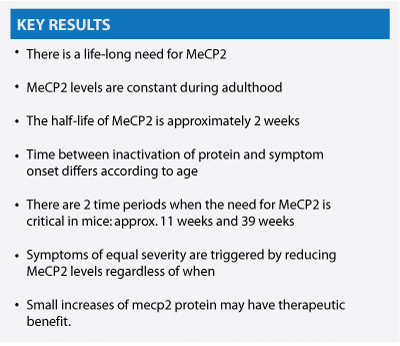 MC The other potentially clinically relevant information comes from comparing the severity of symptoms seen in the mice in this study versus the adult knockout done in the Zoghbi lab and correlating symptoms to amount of MeCP2 protein. Your experiments yielded 3% more protein and resulted in less severely affected animals. Can you elaborate? HC That such a small difference in protein could have such a significant impact on survival is unexpected and indeed may be relevant for therapeutic interventions. We may not need to get the protein back to wildtype levels to have an effect. It may be possible that even small increases may be helpful. MC Congratulations to you both on this publication. The Bird lab has made numerous seminal contributions to the Rett field. The Rett parent community doesn’t typically have a chance to glimpse the researchers behind the experiments, doing the day-to-day work, so I’m delighted to provide an opportunity for our readers to get to know you a bit. I look forward to the next publication. Best wishes for your ongoing work. Last month brought me to Houston, Texas to attend a fascinating meeting organized by Huda Zoghbi and Morgan Sheng and co-sponsored by RSRT. Entitled Disorders of Synaptic Dysfunction, the event was the inaugural symposium of the recently established Jan and Dan Duncan Neurological Research Institute, directed by Dr. Zoghbi. The two-day meeting brought together a heterogeneous group of scientists from academia (senior and junior faculty as well as post-docs and graduate students), industry, NIH and other funding agencies. The focus was not on a single disease but rather on a group of disorders (Rett, Angelman, Fragile X, autism, Tuberous Sclerosis) that share a common cellular phenotype: abnormal synapse activity. It’s no surprise that some of the talks that generated the most buzz came from labs that are doing very clinically relevant research. These include the labs of Mark Bear at MIT, working on Fragile X, and Ben Philpot at UNC whose lab works on Angelman Syndrome. Like Rett Syndrome, Fragile X is a single gene disorder, caused by mutations in a gene called Fmr1. When Fmr1 is mutated, protein synthesis fails to shut down, leading to excess. Some years ago Dr. Bear proposed that compounds which can block a certain type of receptor, mGluR5 (which triggers the burst of synaptic protein synthesis) might counteract over-expression of protein and thereby cancel out the damaging effect of Fmr1 deficiency. His theory has proved correct, and clinical trials of mGluR5 antagonists are currently ongoing at multiple pharmaceutical companies. 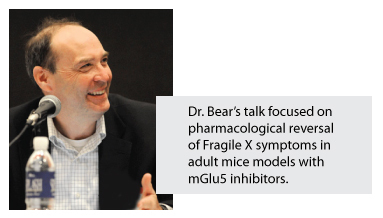 I first met Dr. Bear almost a decade ago, when he was just beginning to formulate what is now commonly known as the mGluR5 theory of Fragile X. 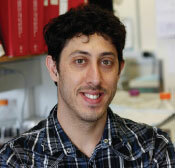 His lab is currently funded by RSRT to explore protein synthesis in the Rett mouse models. Dr. Bear hypothesizes that Rett may be due to under-expression of proteins. If his hypothesis holds up, pharmacological manipulations of mGluR signaling will be pursued. Ben Philpot’s talk also generated excitement. He discussed a high-throughput screen that has yielded a compound which can activate the silenced Angelman Syndrome gene, UBE3A. Dr. Philpot is currently funded by RSRT to pursue a similar approach for the silent MECP2 gene on the inactive X chromosome. Jackie Crawley of the NIH gave a brilliant talk on how “autistic mice” are being characterized to yield a plethora of new information. For me the highlight of her talk was hearing recordings of mouse “speech”. She shared a variety recordings and I was taken aback by the complexity and richness of the sounds, which left me yearning for an analysis of Rett mouse vocalizations. After a lively cocktail hour it was back to work with dinner plates in hand. Drs. 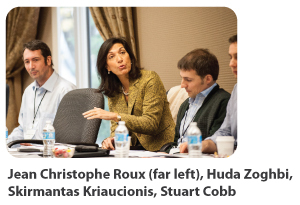 Zoghbi and Sheng divided the attendees into three working groups: 1) dysfunction of proteins of the synapse 2) dysfunction of nuclear/cytoplasmic proteins 3) young investigators and junior faculty. Masquerading as a 30-something I happily joined the third group. I was struck by the fearlessness and boldness of these young scientists. There were not shy about criticizing the status quo and what could be done differently to enhance the research progress. I came away feeling buoyed and reassured that science is in good hands with this new generation. The following several hours of discussion, led by Rodney Samaco and Mingshan Xue and facilitated by NIMH Director, Tom Insel, were intellectually stimulating and entertaining. Below is a visual output of our intense discussion. Over and over again throughout the meeting I heard comments from autism researchers such as: “Where would we be without the syndromic autism animal models like Rett and Fragile X? We’ve learned so much from them”. More than once I found myself thinking that as horrible as Rett is at least the genetics of the disorder are clear-cut – Rett’s silver lining. The meeting provided an opportunity to meet some scientists with whom I had communicated by email and/or phone, but never met in person. People like Pat Levitt, Freda Miller and Michael Palfreyman. It was a reminder of how many people over the years have taken the time to discuss their work and possible synergies to Rett Syndrome. Drs. Zoghbi and Sheng kept everyone busy from the moment the meeting started to the moment we left, including an intense working dinner. I tend to do the same thing at meetings that I organize, but always feel like I’m being a bit of a slave driver. Never again, however, will I feel guilty. If Dr. Zoghbi thinks it’s acceptable, then so do I! Kudos to Drs. Zoghbi and Sheng for a stimulating meeting and thank you both for inviting me. Science Translational Medicine, which co-organized the meeting, will be publishing a white paper on the proceedings. RSRT will let you know when the paper is available. The recent publication of the Kipnis paper in Nature has generated understandable excitement and questions in the Rett community. Email and Facebook are difficult vehicles for providing proper answers. Rett Syndrome is complex, and so is the research; this work doesn’t lend itself to sound bites. I know Rett mothers and fathers are often tired and overworked, but I encourage you to find fifteen minutes to sit down together with a cup of coffee, listen carefully to what these researchers are discussing in the video interview, and come away more deeply informed. The paper has already been euphemistically coined the bone marrow transplant paper. I’ve occasionally called it that myself, sometimes in the presence of Dr. Kipnis, who promptly says, “Please don’t call it that. There is so much more information in that paper than just the bone marrow experiments.” He’s right. In fact, there is enough material to have generated multiple publications. The paper is attracting an unusual amount of attention in the scientific community, and this is bound to stimulate more interest in Rett Syndrome and the role of the immune system in neurological disorders. The bone marrow transplant result is understandably what families gravitate to because of the potential for clinical application, but it’s important not to ignore the other findings, because they too could point to eventual treatments. In fact, it is my fervent hope that in time, new discoveries will make it possible to manipulate the immune system through a safer route. Bone marrow transplants (BMT) have been used since 1968 to treat an increasingly wide range of disease, including cancers, metabolic diseases, inherited red cell disorders and immune disorders. The treatment can be lifesaving. It can also be fatal. Accompanied by chemotherapy and/or radiation treatment, BMT is a serious and grueling procedure with significant side effects. The combined expertise of specialists in pediatric BMT, as well as in Rett Syndrome, together with basic scientists is crucial to minimizing risk as much as possible. As part of a fact-gathering process, RSRT has been facilitating talks between top pediatric transplant centers and Sasha Djukic, Director of the Rett Syndrome Center at the Children’s Hospital at Montefiore, Jonathan Kipnis and his lab members and, most recently, NIH. Discussion includes defining the data needed to consider clinical trials. This must be completed and thoroughly evaluated in order to design the best possible treatment protocol. Independent confirmation of the results achieved by Dr. Kipnis and his team is a standard requirement; this work is already underway. Further experiments in the Kipnis lab itself are ongoing, and we can expect more new information to emerge. It is perhaps timely for me to reiterate that RSRT is very aggressive about research, and conservative about clinical application. I want to be crystal clear on one thing – parents should not take it upon themselves to pursue BMT for their child. As the mother of a severely afflicted daughter, I understand all too well the desperation for treatment. As Executive Director of RSRT, I understand equally well the importance of applying meticulous due diligence. RSRT does this in all the work we undertake, the projects we review, our financial decisions, and certainly in our approach to clinical trials. I share your excitement, your urgency and your trepidation, and RSRT will continue to inform you of new developments as they unfold. Half a century ago, a mother whose baby daughter was diagnosed with a life-threatening genetic disorder decided to fight it. 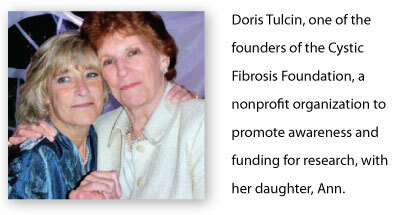 Doris Tulcin is that mother, and Cystic Fibrosis is the disease against which she went to war. First identified in 1938, Cystic Fibrosis affects roughly 30,000 children and adults in the United States and is therefore, like Rett, classified as a rare disease. In 2010 the Cystic Fibrosis Foundation generated donations in excess of $300 million, $120 million of which was raised from the general public. Now, Vertex Pharmaceutical’s VX-770, the first drug that treats not just symptoms but the underlying genetic cause of Cystic Fibrosis, has been fast-tracked through FDA approval. 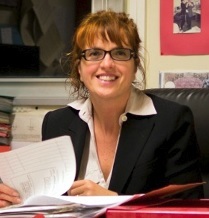 Doris Tulcin has been a valued advisor to RSRT since our inception three years ago. The following in an excerpt from a recent conversation between Mrs. Tulcin and RSRT Executive Director, Monica Coenraads. MC: Congratulations! You must be thrilled with the early FDA approval—it’s been a long road and I know CF families are rejoicing today! DT: It’s mind-blowing! VX-770 is for a small group of patients that have a rare mutation but will literally change the disease and these kids completely. And that’s what we are working on now for 90% of the patients with the major mutation. Things are moving really well. MC: CFF provided substantial scientific, financial and clinical support for the development of VX-770, including the investment of $75 million. When I think about the vast amount of money CFF raises, with a patient population similar to Rett, I can’t help but ask myself, How have you done it? Are there specific decisions that you think have been pivotal? DT: Well, you must remember that we have a long history; we’ve been in business since 1955. So it took over fifty years to get to where we are today. Going back in time, it is so hard to pinpoint any one thing. But we really focused on research, as you are doing. MC: Of course, the scientific tools and knowledge that were available fifty years ago are so very different from research today. Everything has accelerated. Yet I know that getting to this point with Cystic Fibrosis has been a process with many components. focused on working with the biomedical community and pharmaceutical companies for drug development. MC: As with Rett syndrome, the Cystic Fibrosis population is small. You know RSRT has a PSA that’s running in Times Square, the same screen that was used for the CFF. So 1.5 million people will see it every day for three months. How important do you feel it is to raise general public awareness, in terms of the ability to raise research funds? DT: Name recognition is very important. The general public doesn’t have to understand the disease but they certainly have to recognize the name. You know, people will say “I’ve heard of Cystic Fibrosis”— well, what do you think it is? They can’t describe it. They haven’t the vaguest idea, but they’ve heard of it. MC: And you think that correlates to the amount of money you raise? DT: I do. Our chapters raise roughly $100 million a year. But keep in mind that it took decades to get where we are today. MC: For RSRT, at the three-year mark, most of our revenue comes directly from affected families and their networks. Do you think the same applies to you, or do you have people just spontaneously donating to CFF without any personal connection? DT: I think now we do, yes. But what we started with and built on was indeed that personal commitment and involvement to develop networks of family and friends. The activism of those who are personally affected is crucial. MC: How would you compare the current philanthropic landscape to what you’ve seen in past decades? These are difficult economic times for many. DT: Yes, we are still in a bad economy now and that reflects on contributions, there’s no doubt. It’s tough, and there’s always competition and distraction. MC: On a personal note, how is your daughter doing? DT: Oh, thank God, she’s doing well. She’s a grandmother! My grandchildren have introduced me to Facebook, so we communicate in that way, because they’re all grown up and don’t have time for other things. But we do that too with the foundation, we’re on everything you can think of— Facebook, Twitter, YouTube. Everything now is sent electronically. The website is being updated all the time, you can get every bit of information at any time off that website. MC: Yes, the fact that electronic media is now ubiquitous worldwide has really changed the flow of information in important ways for families dealing with something like a rare disease. The ability to be in instant communication with others who really understand relieves some of the isolating strain of constant and intense caregiving, as well as keeping people informed of current developments. That families can so easily connect and learn from each other is vital and sustaining. The day-to-day struggles can be so overwhelming sometimes for Rett parents that there’s not always a lot of energy left for what I feel is truly going to change our children’s lives—the research. What are your thoughts? DT: There is no doubt that you really have to find ways to stay focused, and I think that was one of our biggest successes. Care has been important but it is research that’s absolutely critical; it’s the only way to move forward. DT: Monica, I know how tremendously devoted you are to this fight. The Rett community is very blessed to have you. Many of you know that my involvement in Rett Syndrome is personal. I have a daughter who suffers greatly from every Rett symptom in the book. She is now 15 years old and every year brings new challenges. In the last six months she has developed severe Parkinsonian symptoms: violent tremors, increased rigidity, difficulty initiating movement. 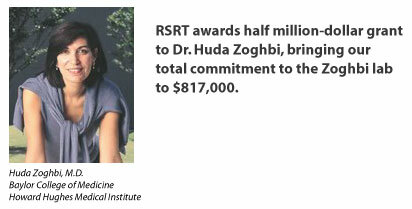 Today RSRT is pleased to announce that we are adding to our portfolio of potential treatment options with $515,054 of new funding for Huda Zoghbi and her lab. 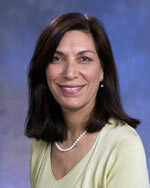 Dr. Zoghbi needs no introduction to anyone familiar with Rett Syndrome. 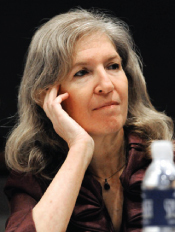 She identified MECP2 mutations as the cause of Rett Syndrome in 1999 and has consistently added to our body of knowledge about the disorder, the animal models and the protein in the years since then. Simply put, the field of Rett would look very different without Dr. Zoghbi. This latest award, entitled “Investigating Novel Therapeutic Approaches for Rett Syndrome” includes three separate objectives, each of which has potential clinical relevance. The first objective tests a pharmacological intervention while the other two are aimed at altering the activity of the neural network. 1) Test drugs on Rett mouse models to enhance the cholinergic pathway. 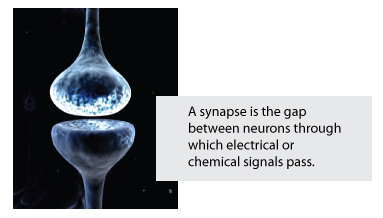 This neurotransmitter pathway is critical for learning, memory and regulation of the autonomic nervous system. Drugs exist that can be used alone or in combination. If we find the data from mouse models encouraging, then the findings could be immediately transitioned into clinical trials. 2) Explore deep brain stimulation (DBS) as novel treatment strategy. DBS has revolutionized the treatment of Parkinson’s and is now also used for depression, OCD, Alzheimer’s and more recently in pediatric disorders such as dystonia and Tourette. The availability of Rett mouse models allows us the opportunity to explore potential benefits of this procedure for Rett. Again, encouraging data can be quickly moved to the clinic. 3) Boosting Mecp2 levels in normal cells. Girls with Rett have approximately 50% normal cells and 50% cells which lack the MeCP2 protein. Dr. Zoghbi will explore whether boosting MeCP2 levels in the cells that already have normal amount could enhance the overall neural network activity even though the other 50% have no protein. If boosting levels in normal cells rescues some of the symptoms this would set the stage for a large scale effort to identify targets that can modulate MeCP2 levels. Please join me in congratulating Dr. Zoghbi on this award and wishing her the very best as she pursues these new lines of inquiry. I’d also like to take this opportunity to congratulate her once again on being awarded the prestigious 2011 Gruber Neuroscience Prize which was presented during last month’s annual meeting of the Society for Neuroscience. On a chilly day in early spring, an unlikely group gathered in a spacious office at Harvard Medical School – the office of Michael Greenberg, Chairman of the Department of Neurobiology, one of the most respected and prolific neurobiology departments in the world. Joining Dr. Greenberg was Adrian Bird of the University of Edinburgh and Gail Mandel, a Howard Hughes Medical Investigator from Oregon Health & Sciences University. These names are well known to anyone who is at all familiar with the Rett research literature, yet none of these distinguished scientists would describe themselves as a “Rett Syndrome researcher.” The questions that have kept them busy throughout their careers revolve around basic science phenomena such as DNA methylation, gene expression and brain plasticity. Each of these scientists has been drawn to Rett Syndrome via a different route, and their combined interests will now create a powerful synergy to explore the most basic mystery of Rett: What is the precise function of MeCP2 in the brain? Dr. Greenberg called me one day last year and said “I’m coming to you with a far-out proposition.” He confessed that elucidating the role of MeCP2 was the most challenging problem he had ever worked on (a striking remark, coming from a scientist as accomplished as Dr. Greenberg) and that the chances of success would be greatly increased if he could put his head together with outstanding researchers with complementary expertise. He asked me to explore whether there might be any mutual interest on the part of Drs. Bird and Mandel. I did so, and the response was enthusiastically positive. Synchronicity was on our side. RSRT Trustee Tony Schoener and his wife, Kathy, were interested in funding a high-impact project: the MECP2 Consortium was born. I recently caught up with the investigators to discuss this novel and non-traditional collaboration. Coenraads: How would the three of you define the goal of the Consortium? Bird: The goal of the Consortium is to bring about a step-change in our understanding of the function of MeCP2 in relation to Rett Syndrome, which we believe will be vital for designing rational treatment therapies. Unlike most other autism spectrum disorders, we know exactly the root cause of this disorder, but explaining in molecular terms just why absence of functional MeCP2 brings about Rett’s particular constellation of symptoms still eludes us. We already have useful information about what MeCP2 might do in cells – we know it is a chromosome binding protein that targets DNA methylation; we know it becomes chemically altered when nerve cells are active; and we know that other types of cells in the brain apart from nerve cells also need MeCP2 for the brain to function normally – but there is no consensus among scientists about why MeCP2 is needed for the brain to work properly. 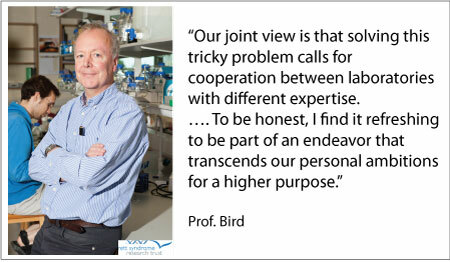 Our joint view is that solving this tricky problem calls for cooperation between laboratories with different expertise. Gail, Mike and I have rather different slants on biology due to our training and backgrounds, but we appear to complement each other nicely. Our view is that the next few years will see advances in our understanding of both MeCP2 and the brain. The timing feels right and it will be exciting to see what happens. Mandel: The goal of the Consortium, from my point of view, is to put our heads together to generate new ideas, and to critically evaluate each other’s ideas and experiments, and to collaborate on experiments where the expertise is complimentary. I also view it as an opportunity to engage our young scientists in training in rigorous translational biology. Coenraads: That is a good point Dr. Mandel. The Consortium goes well beyond the three of you. It requires the active participation of all of your lab members, who will be interacting with each other on a regular basis. Greenberg: I propose that “speed” is a part of the equation as well. 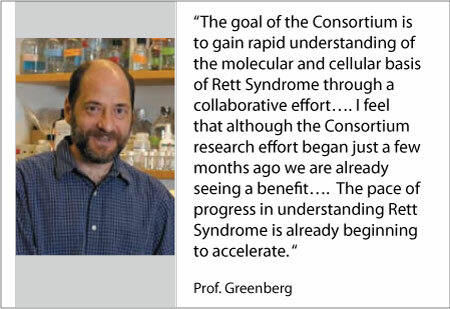 The goal of the Consortium is to gain rapid understanding of the molecular and cellular basis of Rett Syndrome through a collaborative effort. Coenraads: During the 12 years that I’ve been working with the scientific community the concept of consortiums has been discussed from time to time. It strikes me that what differentiates a true collaboration from one that is superficial and in name only is that the desire to collaborate has to come from the scientists themselves. Collaborations cannot be imposed from above and made attractive with the bribe of money. Meaningful collaborations come from the bottom up and are nurtured by mutual respect and trust and a strong sense that the whole will be greater than the sum of its parts. How is working with the Consortium different than how you’ve worked in the past? Has it required any kind of mental shift in your personal working style? Mandel: Having had a long-term collaboration with my husband, who is also a scientist, I have first hand knowledge of the virtue of consortiums. My personal style has also, I think, been open to collaboration. Similarly, my lab members work very well as a team. Bird: Science is normally a competitive activity. Discretion at least is required, if not complete secrecy, if one is to avoid the trauma of being beaten to your goal by other laboratories and scooped by their prior publication. This dog-eat-dog culture among many researchers has its advantages in that it can accelerate discovery, but is often at odds with the needs of a charity like RSRT, which may wish to have scientists putting their heads together to solve pressing, clinically relevant problems. Our consortium intends to do the latter. We share unpublished data and resources. We speak regularly on the phone and meet several times a year to bring each other up to date on what’s new. The Consortium is still at the beginning, but already it is having an impact on the research going on in our laboratories. To be honest, I find it refreshing to be part of an endeavor that transcends our personal ambitions for a higher purpose. Greenberg: I agree. I feel that although the Consortium research effort began just a few months ago we are already seeing a benefit. The pace of progress in understanding Rett Syndrome is already beginning to accelerate. My expectation is that through collaborative interactions with the Bird and Mandel laboratories we will be able to overcome current obstacles to understanding the molecular basis of the disorder. I think that we can expect to make key discoveries that will lead to new ideas for therapies for treating Rett Syndrome in the near future. Coenraads: I think it’s also important to point out that the discoveries that the Consortium will likely yield will help not only Rett Syndrome but also the MECP2 Duplication Syndrome and all disorders caused by alterations in MECP2. RSRT has committed $1.8 million to the MECP2 Consortium. The Schoeners have contributed $1 million to the endeavor. It’s an understatement to say that without them it’s unlikely we could have launched the Consortium so quickly. I thank them for their generosity, commitment and frankly, their belief in the scientific process. To the three of you I wish you much success. I look forward to our monthly Consortium calls and in-person meetings and to keeping our readers apprised of your progress. A paper published online today in Nature reveals that glia play a key role in preventing the progression of the most prominent Rett Syndrome symptoms displayed by mouse models of the disease: lethality, irregular breathing and apneas, hypoactivity and decreased dendritic complexity. The discovery, funded in part by the Rett Syndrome Research Trust (RSRT) was led by Gail Mandel, Ph.D., an investigator of the Howard Hughes Medical Institute at Oregon Health and Science University. Brain cells can be divided into two broad categories: neurons and glia. The three types of glial cells are the star-shaped astrocytes, the oligodendrocytes, and microglia. Historically, neurons have received most of the attention, while glia were thought to play a secondary supporting role. During the past several years it has become increasingly clear that glial cells contribute in very complex and dynamic ways to healthy brain function and are important players in Rett Syndrome. Monica Coenraads speaks with Gail Mandel, PhD and Dan Lioy, a graduate student in her lab, to discuss their data published online today in Nature, concerning the influence of glial cells on the progression of Rett Syndrome symptoms. MC: It’s good to speak with you both again, and congratulations on the new Nature publication. MC: Let’s go back in time a little bit to give this work some context for our readers. Soon after the discovery that mutations in MECP2 cause Rett Syndrome, a researcher with a longstanding interest in chromatin, Alan Wolffe, organized a scientific meeting in Washington DC. I had just co-founded the Rett Syndrome Research Foundation, which provided financial support for this meeting. It was the first scientific meeting I attended and it stands out very prominently in my mind. And it was there, over a decade ago, that I first met you. After the meeting we stayed in touch, and I remember trying to get you involved in Rett. At first you were somewhat resistant, but eventually you really jumped in with both feet. What triggered that shift? GM: My lab was, and is still today, working on a gene called REST, which is a repressor. We had been doing biochemical experiments and we noticed that MECP2 was one of the proteins that were in the vicinity of the REST binding sites. We didn’t know much about MECP2 so we started reading about it. This was in 2002. 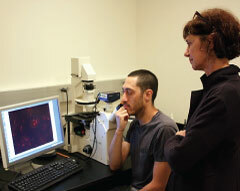 Nurit Ballas was in my lab at the time, and she and I became interested in where MECP2 was in the nervous system. And we were perplexed, because it was supposed to be a ubiquitous protein, but people were thinking it wasn’t in glial cells. Basically, Nurit and I were skeptical, because we know a lot about repressors, and ubiquitous repressors in particular, and from a molecular biology standpoint, it just didn’t make a lot of sense to us that MECP2 would be excluded from glia. So Nurit did her own experiments to search for MECP2, and she found it in purified glia, and using immunocytochemistry she showed it was in tissue—in glia in tissue. And that made us consider the possibility that MECP2 could be regulating something in glia. MC: And that finding is a perfect example of why it’s always good in a field to reach out to new people who will bring their own experience, curiosity and fresh ways of looking at a problem. You published your first paper on the subject in early 2009 in Nature Neuroscience. Dan, please give our readers the highlights of the new paper that just came out in Nature. DL: The key point of the paper is that in a mouse model that has no MECP2, putting MECP2 back just in astrocytes goes a long way toward correcting the Rett phenotype, especially the respiration problems. We also document that knocking out MECP2 only in astrocytes causes a phenotype, including a respiratory phenotype. But interestingly, and I’ll be the first to admit that I’m not yet clear on why this is—the phenotype isn’t complimentary to the extent of the rescue. In a simple world one would do an experiment and find that if putting MECP2 back in one cell type corrects the phenotype then removing it from that cell type should, logically cause the phenotype with equal severity. And so far, that doesn’t seem to be the case. What I take away from our experiments is that neither MECP2-deficient neurons nor glia alone are sufficient to cause the full-blown Rett phenotype. But conversely, putting MECP2 back in just neurons or glia can go an extremely long way in correcting the phenotype. A scientifically interesting question is: Why is that? GM: That was really the unexpected part. DL: One possibility that we’ve discussed at length is that both cell types, neurons and glia, must be mutated to get the full phenotype. There is precedence from other diseases, like ALS, that says that neurons and glia contribute to the pathogenesis of the disease, but they do so differently. And we wonder whether or not this may actually be a general model that’s also applicable to Rett. MC: Was this finding surprising? GM: Yes, it was. Thankfully we did both experiments pretty much at the same time, knocking it out and putting it back. Otherwise I’m not sure we would have pursued putting it back based on the knockout. Since the knockout was not as dramatic as the null we might have concluded that glia are not very important and the disease is mostly neuronal. But, luckily, we did them both at the same time. MC: Another example of the serendipitous nature of science. Regarding the hypothesis that neurons initiate and astrocytes play a role in the progression of the disease, do you think that’s going to become more of a common theme across diseases? GM: That model was presented initially by Don Cleveland for ALS. I do think it is going to become a more common theme. I think it also means that we need to understand more about how neurons and glia talk to each other. MC: Historically glia have not attracted the type of attention that neurons have, but that is changing. Gone are the days where glia were thought of simply as structural components and nursemaids to the neurons. MC: RSRT is funding a collaborative gene therapy project between your lab and Brian Kaspar. You are using a vector called AAV9, which, depending on when you administer it, seems to target astrocytes. If indeed replacing MECP2 in astrocytes is beneficial then this vector might be quite interesting. GM: So this project is a big risk for my lab to take on in terms of manpower because I don’t know if it’s going to work. But I think the project is so interesting and clinically relevant. In terms of targeting the underlying genetic problem in Rett, either we turn the silent MECP2 on from the inactive X, or we have to think about how to add the gene back. That’s why I think AAV9 may hold promise, because it has good expression and it crosses the blood-brain barrier. There are a lot of labs working on gene therapy approaches so the field is competitive, but I think that is a good thing. MC: Well, we are risk-takers—we can’t afford not to be—so we’re delighted that your lab has become so engaged with Rett and opened up new research vistas. I agree with you about the value of competition, and will follow the unfolding of the next developments in your work with great interest. There is certainly no lack of complexities to explore. We hope the Rett community will continue to benefit from your scientific curiosity and perseverance. Thanks for your time with us today, and we look forward to the next updates.